As I sat in the car it was rocked by the wind that was rushing unimpeded through the valley. 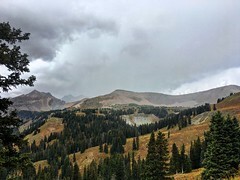 Soggy curtains of rain drifted down from the mountains which were hidden under a steely grey blanket of cloud. I could see cascades on the hillside appearing from the cloud base. It was not the sort of weather that I wanted from an August weekend. I had parked at the end of the single track road at Blaenau Dolwyddelan, room for a couple of cars on the verge. The surrounding fields were flooded and I sat there considering the wisdom of putting my waterproofs in the boot. Reuben had woken from his slumber on the back seat and was keen to get moving. 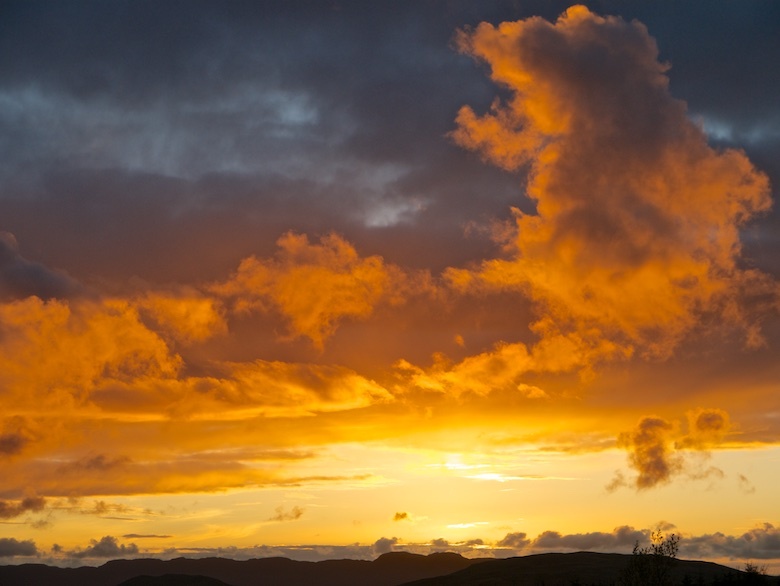 The weather forecast predicted that the rain would stop at 6.00pm and for once they were spot on. After half an hour of staring through the windscreen the rain subsided to a fine drizzle. I grabbed the opportunity to pull on waterproofs, saddle the dog and head out into the murk. 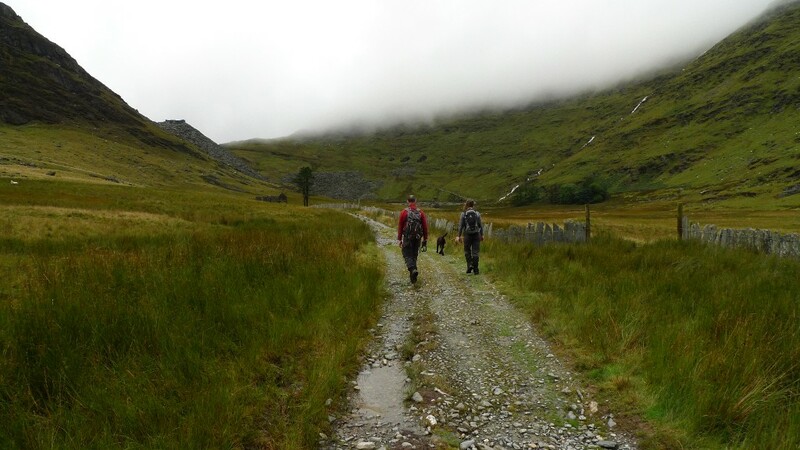 We set off the dogs barking as we passed the farm buildings at Coed Mawr, taking the track that leads into Cwm Edno. 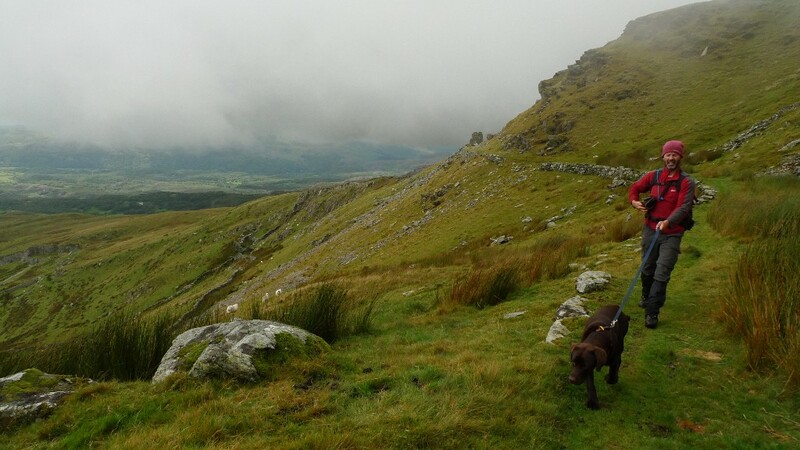 Climbing across the hillside we soon entered the low cloud base and although not raining the air was damp. 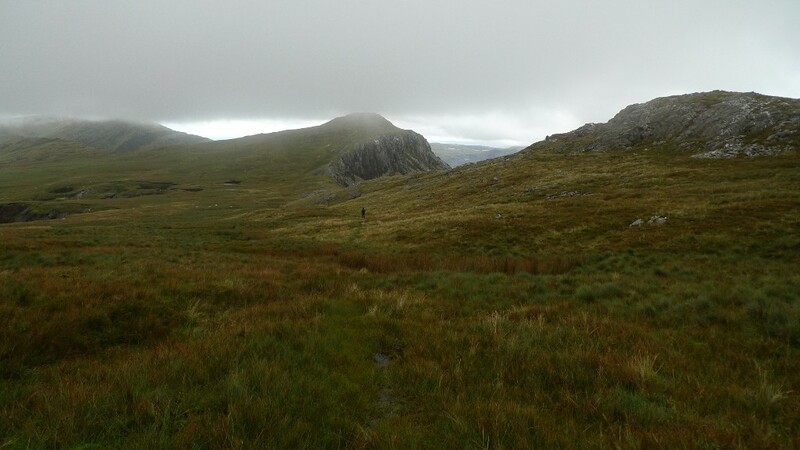 Thankfully we were sheltered from the wind as the clearly defined track led us into the hills and towards the Afon Cwm Edno. The river was a turbulent mass of brown foamy angry water and I was thankful for the bridge. It would have been impossible to cross without it. 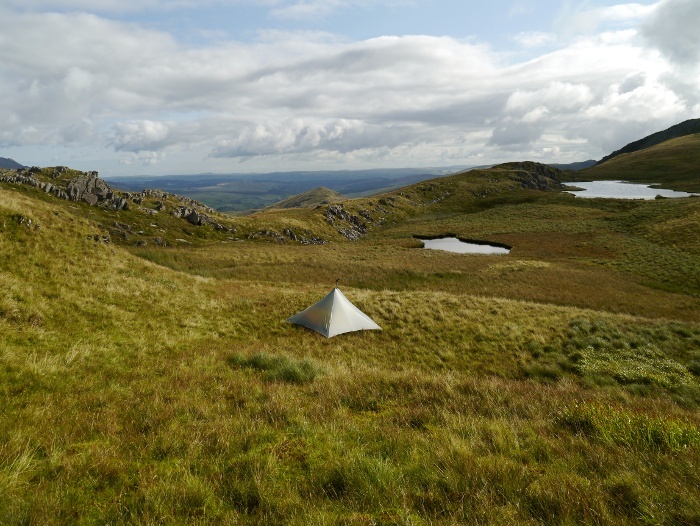 The ground surrounding the river was waterlogged rough moorland, there was nowhere that would provide a half decent pitch for the Trailstar. I had noticed on Geograph a small plantation a few hundred metres up the hill that appeared to have flat cropped grass nearby. As I approached I got a bit excited when I spotted an area of short grass that was indeed nice and flat. I was disappointed to find most of it an inch under water, despair settled in as I realised that there was not much daylight left. I ditched the pack and wandered around the vicinity for a while looking for somewhere that was at least dry. I settled on a patch where I could just about fit my shelter, even if there was a foot high bank to one side. The joy of the Trailstar is how it adapts to lumpy sloping ground and luckily there was a flat bit inside on which I could sleep. The evening was spent cooking and reading whilst low cloud brushed the top of Silnylon. I was relieved to be woken in the morning by sunshine rather than the pitter patter of rain on the Trailstar. Reuben was standing over me when I opened my eyes, eager to start the day (or needing the loo). When in an open shelter I always tie him to something as I worry that I will wake to find he has gone off exploring. On this occasion his anchor was my rucksack. Cwm Edno was totally transformed in the sunshine, Carnedd Moel-siabod towering in front with Yr’ Arddu wrapping round the rugged upper reaches of the Cwm. 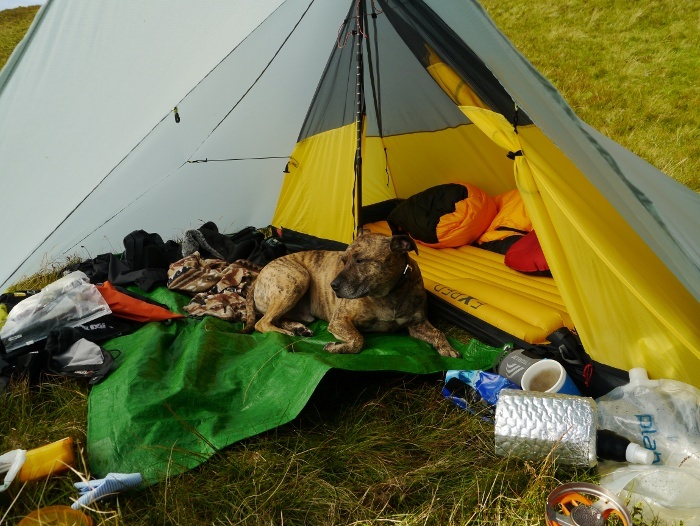 I lazed inside the Trailstar for a while but the warmth of the sun soon drove me on to pack up. 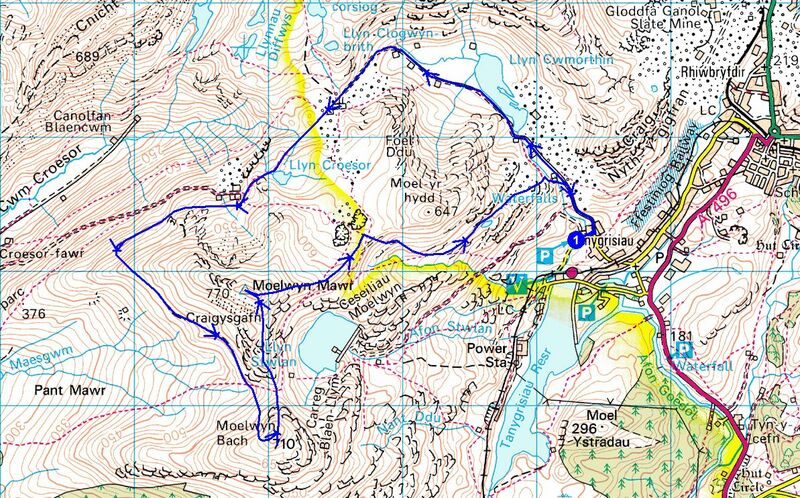 I had a long day planned that would take me all the way to the Manod hills on the other side of Blaenau Ffestiniog. The bridleway to Bwlch y Rhediad is marked by frequent posts, a little unnecessary as the path was clear and easy to follow. 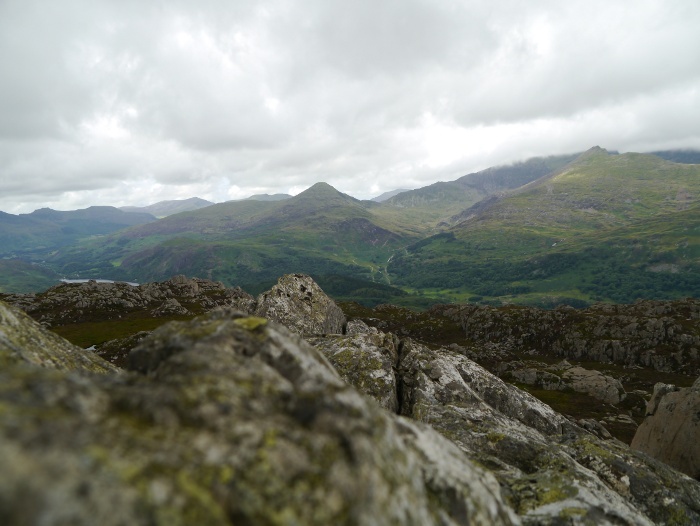 The views to the west opened out, the Glyders and Snowdon hidden under cloud. 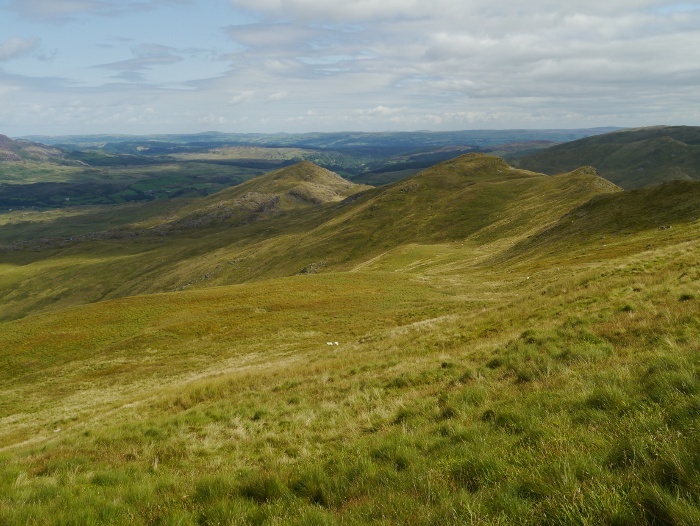 It’s many years since I walked this section of what I think of as the northern Moelwyns. It’s wild country, unfrequented and very very boggy! 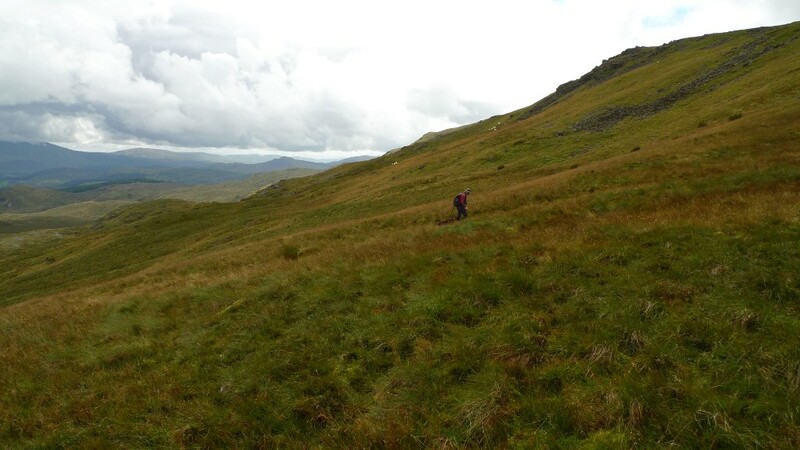 Some of the ground on the way to Moel Meirch would swallow you up whole if you were not careful. On a couple of sections the way forward is impossible, ladder stiles taking you across the fence to drier ground. 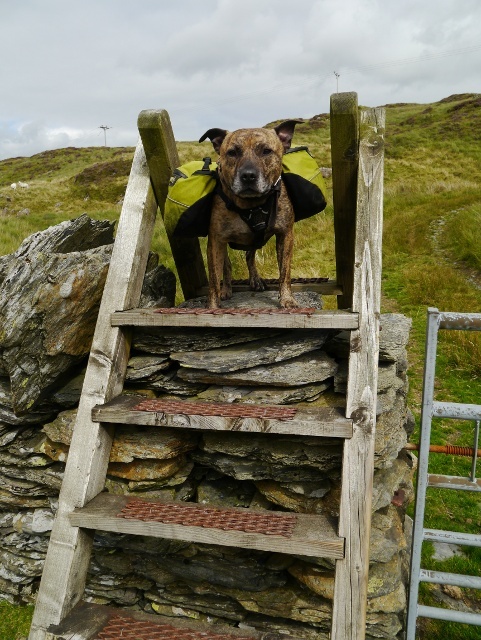 Ladder stiles are never easy with a reluctant hound. 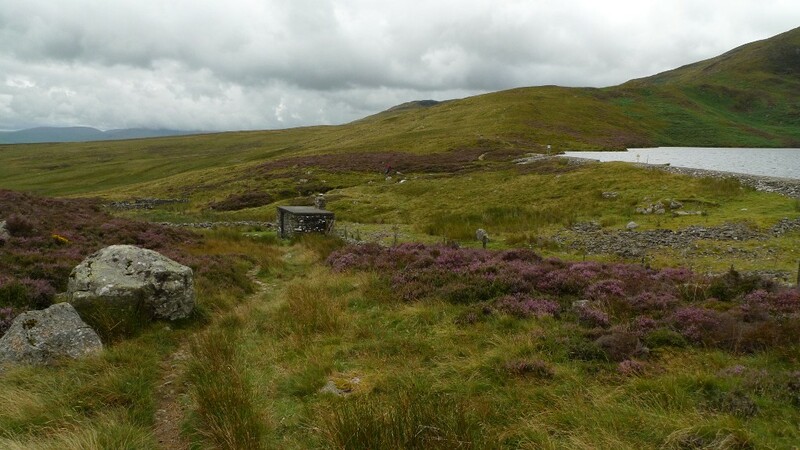 The boggy stretches are more than made up for with a path that winds its way round rocky outcrops and heather in full bloom. 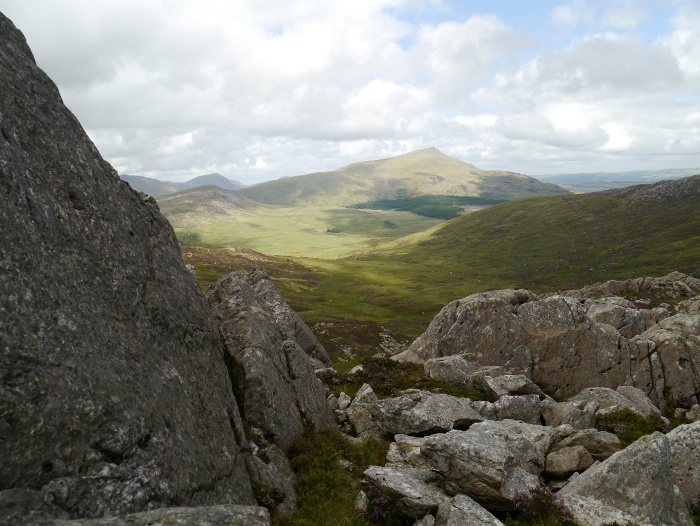 The summit of Moel Meirch packs a punch well above its height, which is just below the magic two thousand foot. 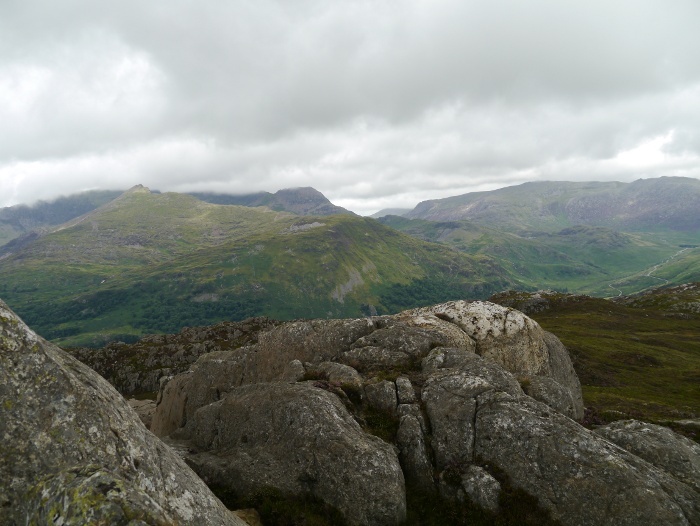 It’s rough and rugged, the top being crowned with crags and boulders. Here I met the only other hikers of the day, both quick to comment on how boggy the ground was. 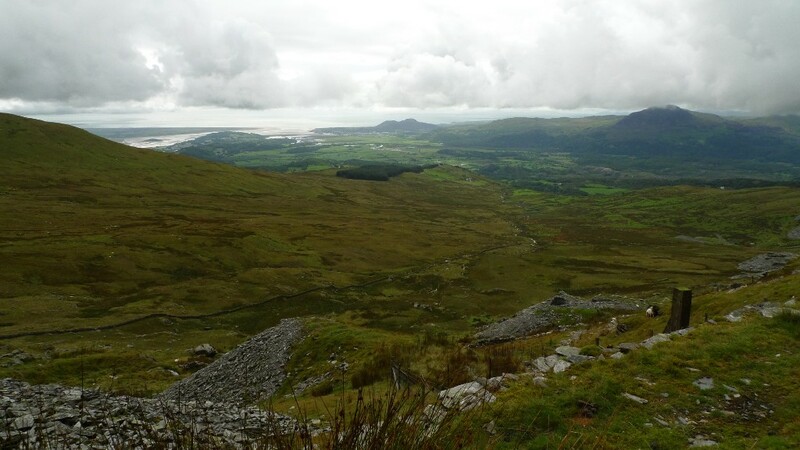 The views are spectacular and filled with the famous giants of Snowdonia. The wind was cold so we descended a little way to the east, sheltering behind a wall of rock. I had my lunch whilst Reuben looked at me with sad eyes, insistent that he would at least get a cheesy biscuit. He did. 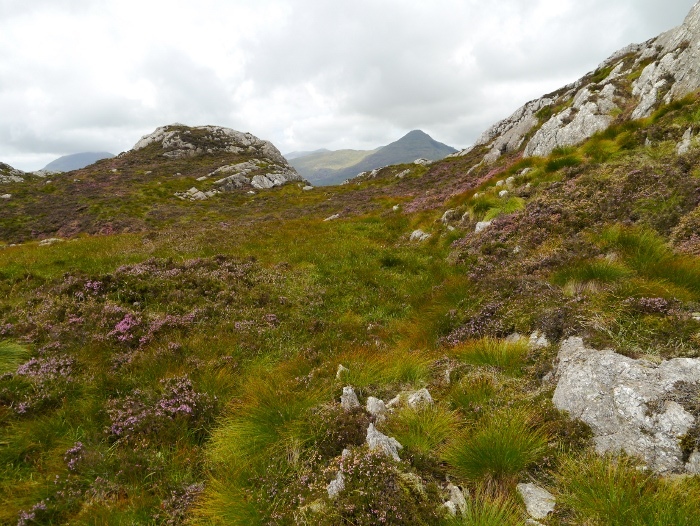 I located a narrow trod that twisted its way through the heather and descended towards Llyn Edno. On the map Llyn Edno looks like an idyllic place to camp. The reality on the ground is bog and heather around the shoreline. 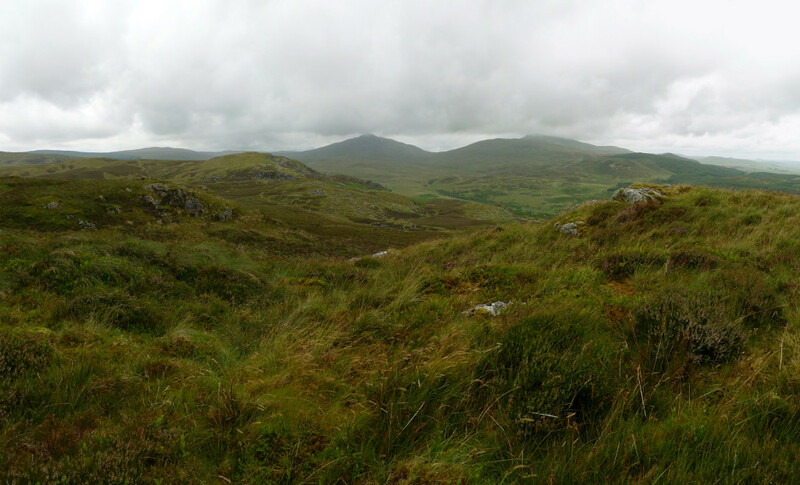 It and its environs however are rather splendid, a tamed down version of the Rhinogs. 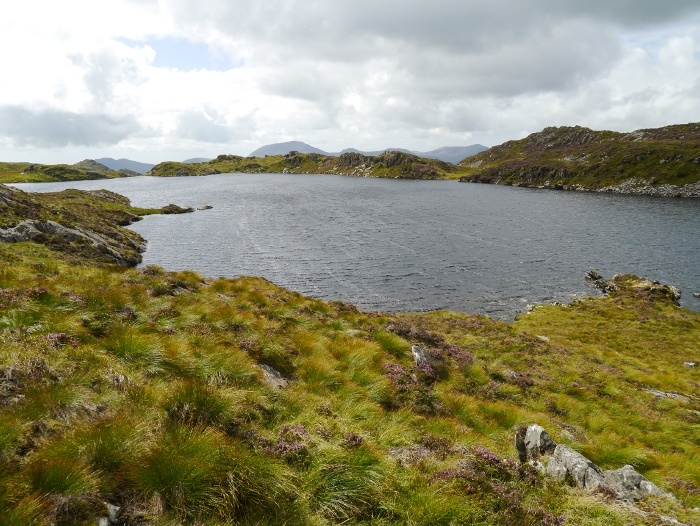 Ysgafell Wen is a long knobbly ridge of a hill, with a trio of lakes called Llynnau’r Cwn, a place I have always fancied camping. 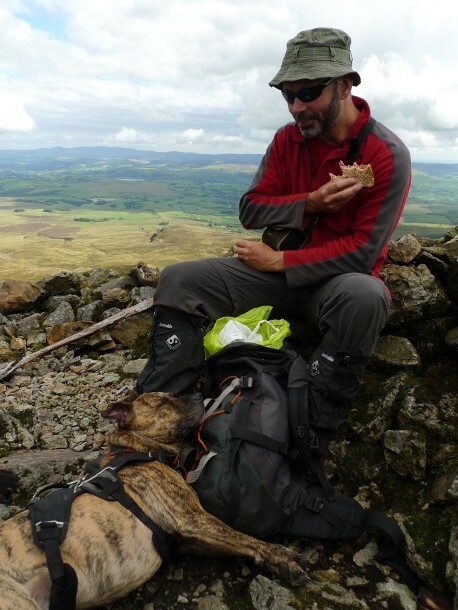 The wind was far too strong so instead I continued on before having another rest with Reuben in the heather. I got a good view towards my final destination for the day, the distant hill of Moel Penamnen which sits on the other side of the Crimea pass. I started having doubts that I would get there. These doubts were soon reinforced by the decoration on one of the fence posts! Like a warning in a cheap slasher movie. 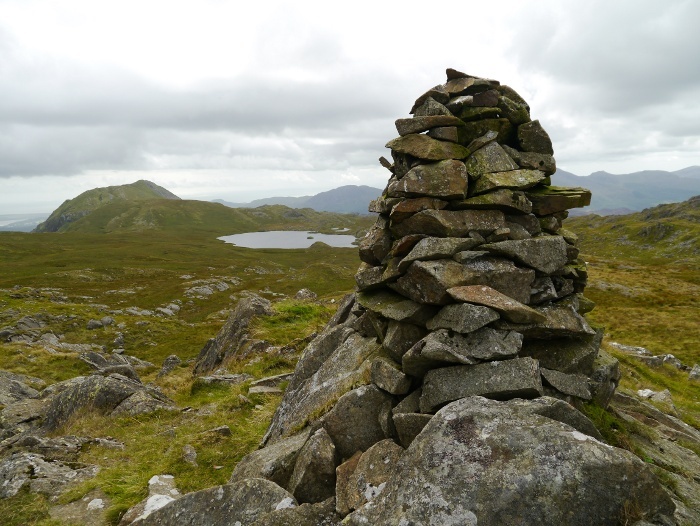 From the summit cairn I could make out the backside of Cnicht. Llyn yr Adar in the foreground is apparently a popular place to wild camp. This in itself is a good reason to avoid, although it is situated in a very scenic spot. 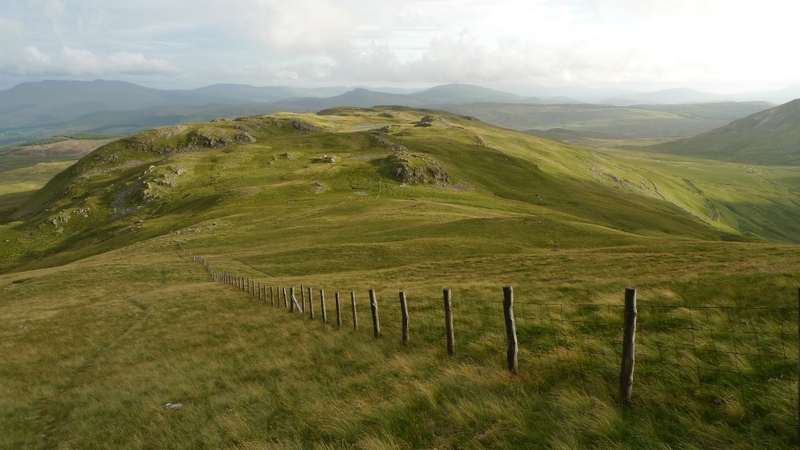 The route towards Moel Druman is easy to follow with a fence to lead the way through the small outcrops and numerous pools of water. I soon became aware that the weather was beginning to change. A sheet of cloud was racing in from the west and the wind was picking up once again. Suddenly I felt tired and my resolve to continue across the Crimea pass and onto another range of hills started to diminish. I decided that if I found a good sheltered spot to camp I would stop and have a lazy afternoon. Things were not promising as I followed the right of way south of the summit of Moel Druman and started the descent towards Llyn Conglog. The wind was strengthening and the cloud just beginning to obscure the surrounding peaks. I fancied pitching next to the extensive sheet of water but that would mean an extended battering for the Trailstar. My luck was in however after descending along the path for a bit, the hill itself proving ample shelter from the wind. A flat shelf of tussock free ground provided a perfect opportunity that I was not going to pass by. 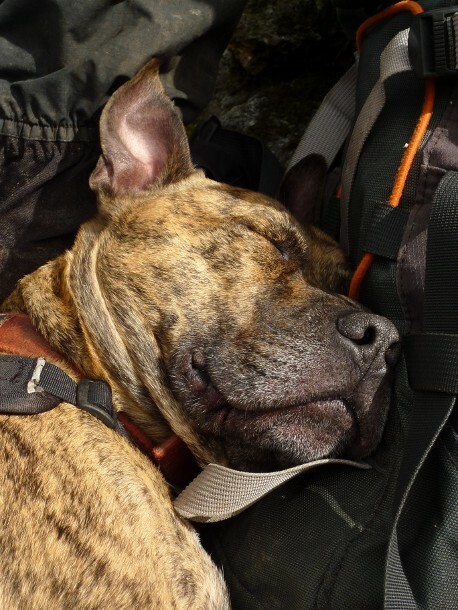 Barely before I had removed my rucksack Reuben had curled up in the grass and started snoring, I think he was happy with the chosen spot. 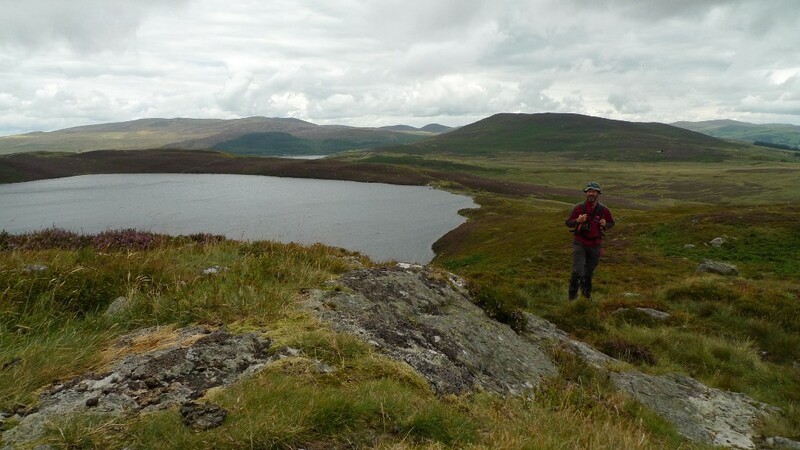 After pitching the Trailstar I wandered over to Llyn Conglog to fill my water bottles. A low fence was in the way which I held down so that Reuben could hop over. It turned out that the damn thing was electric! Now that I carry a water filter with me when backpacking I can fill from pretty much any source, including lakes and tarns. This gives much more flexibility in choosing a pitch as a stream does not need to be located nearby. 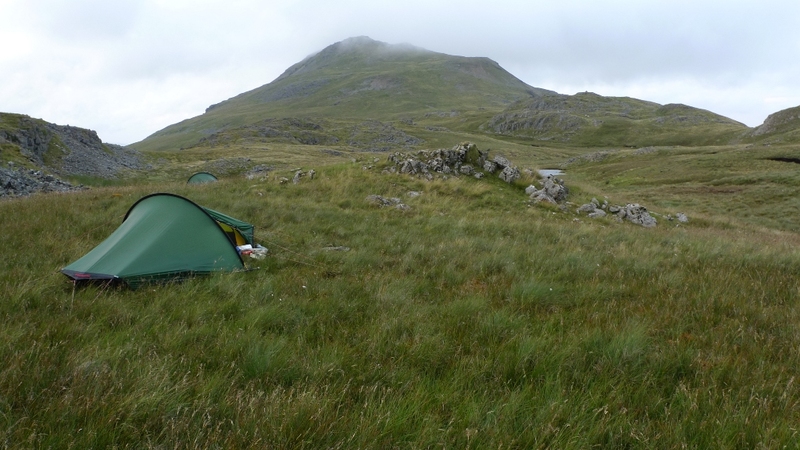 Once back at the Trailstar the cloud lowered even further and a fine drizzle started to fall. I decided that I had made a good decision to stop, even though it was only 4.30pm. Later in the evening the peace was shattered by a trio on trailbikes who filled the air with the sound of revving engines and the smell of exhaust. It was quite alarming as they roared past only a few feet from my shelter. That explained the numerous ruts along these usually quiet hills. The only other excitement that evening was when an internal baffle in my Exped Synmat UL popped, leaving a curious lump for me to sleep on. I was woken by warm sun but continued to doze after deciding to have a short lazy day. The Manod hills on the other side of the Crimea pass could wait for another trip. 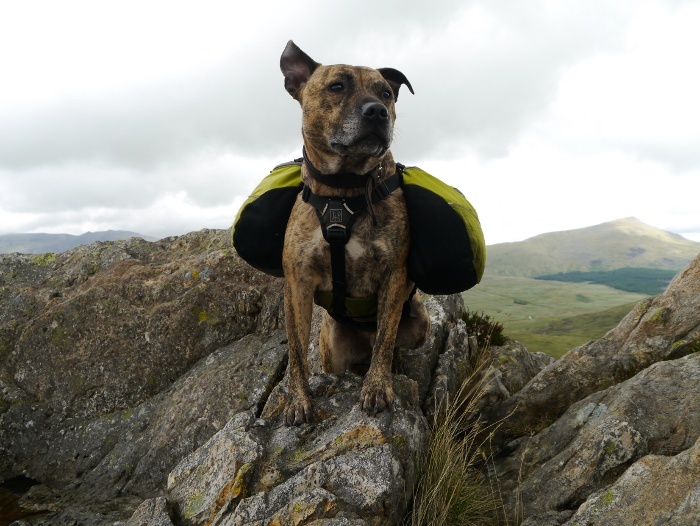 The heat soon drove me out of my sleeping bag and I spent a while wandering round camp with Reuben. The place was transformed in the sunshine. I have to admit that it was probably my laziest wild camping morning yet, with it being gone midday by the time I had packed up. 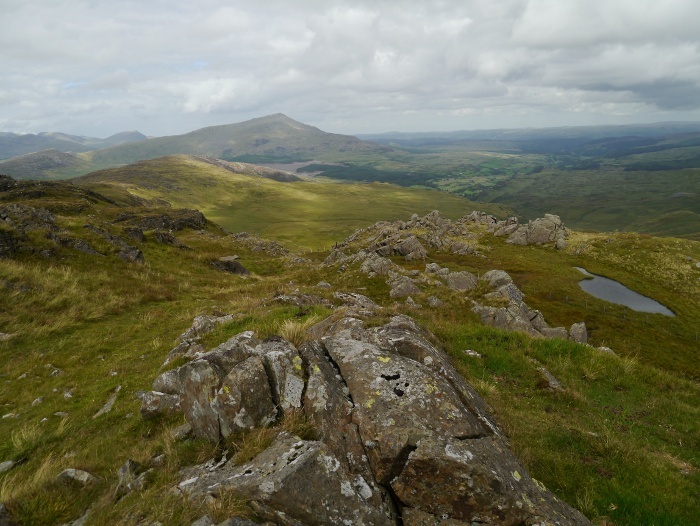 Rather than climb Allt-fawr I decided that I would contour its northern slopes and pick up the ridge that leads to Moel Dyrnogydd. This gave a mile or so of maximum views with minimum effort, not a bad way to start a Monday morning. 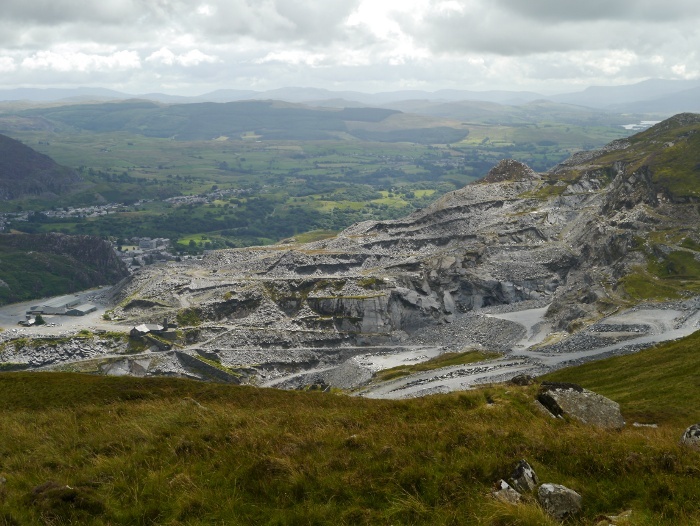 The landscape around Blaenau Ffestiniog has taken a battering over the years by slate quarrying. It’s actually rather impressive in its scale and general grimness. I perched with Reuben for a while and looked over the town, listening to the various beeps and one big bang that came from a working quarry. 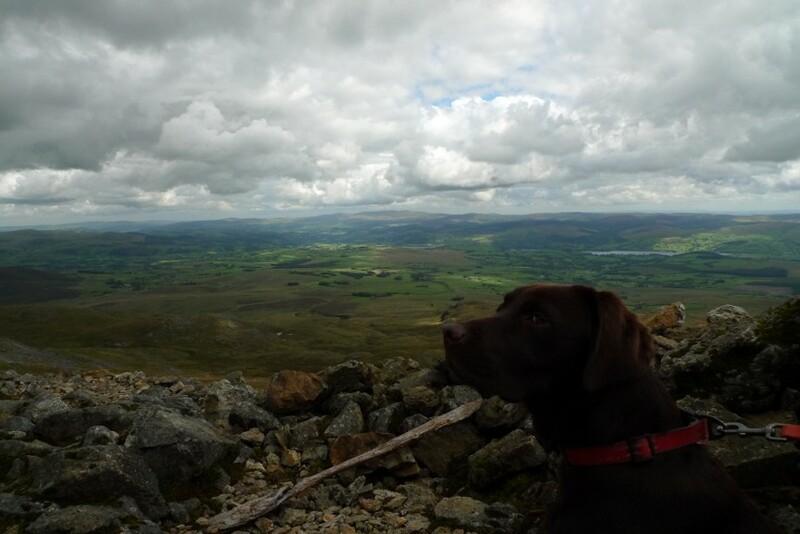 Reuben however was more concerned in keeping an eye out for those four-legged wooly creatures that roam these parts. 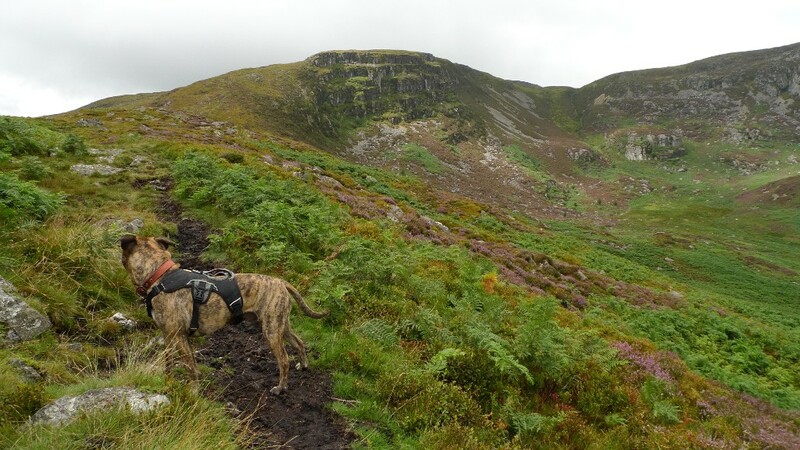 We picked up a track to the east of Moel Dyrnogydd, one final stile being a test for Reuben’s agility. He will never be famous for his climbing prowess. 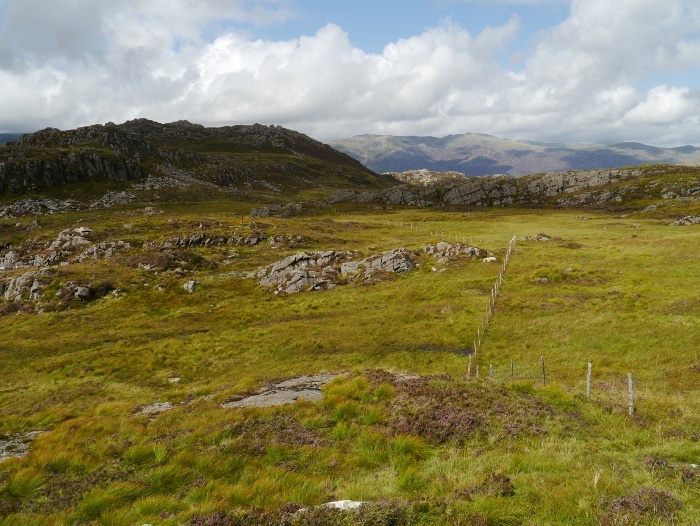 The track unfortunately leaves the right of way which disappears into a mass of bog and tussocky grass. We continued down the track to the edge of access land and I spent a while with map in hand trying to decide what to do. In the end I followed the track through fields and then into a farm-yard with no right of way. Of course the farm dogs started barking their heads off but no one came out of the open front door. Aware that I was trespassing I strided purposefully along the driveway which quickly deposited me to the road end and my car. 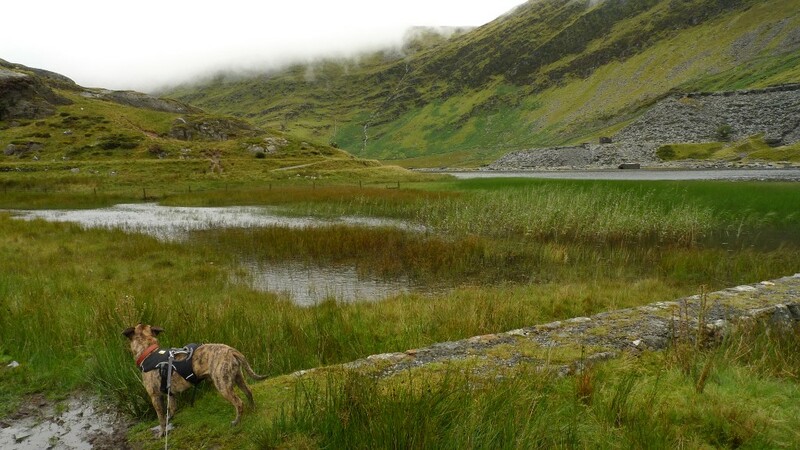 It was two men and two dogs who left the cottage in the lush Tanat valley to head into the wilds of Snowdonia. 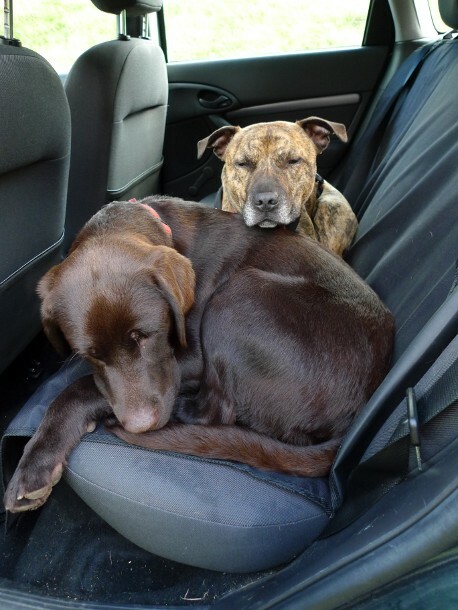 Reuben and Dougal, occupying the back seat were now the best of friends. 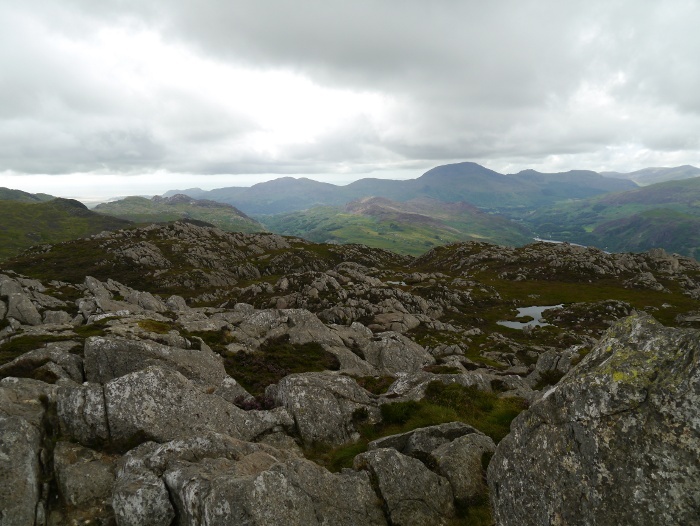 The original plan had been to climb Moel Siabod as I wanted to show Pete one of the best views in Snowdonia. However, the drive to Blaenau Ffestiniog the day before had taken a lot longer than anticipated. 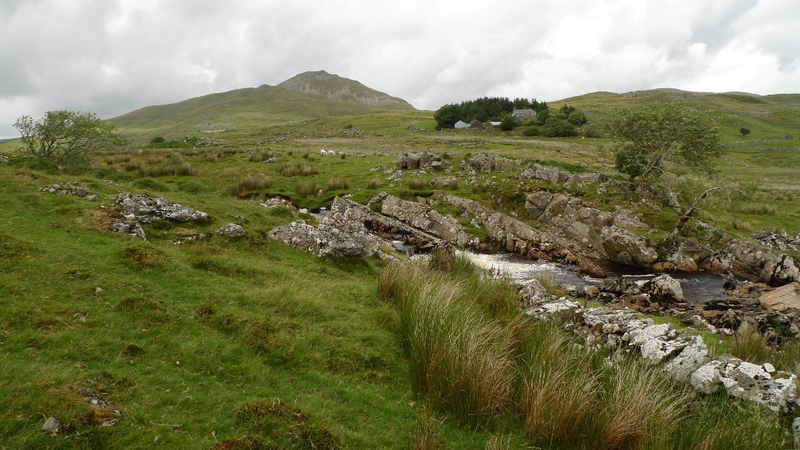 The Arenig hills were much closer and occupy a wild and unfrequented corner of the National park. A good destination for a busy August weekend. 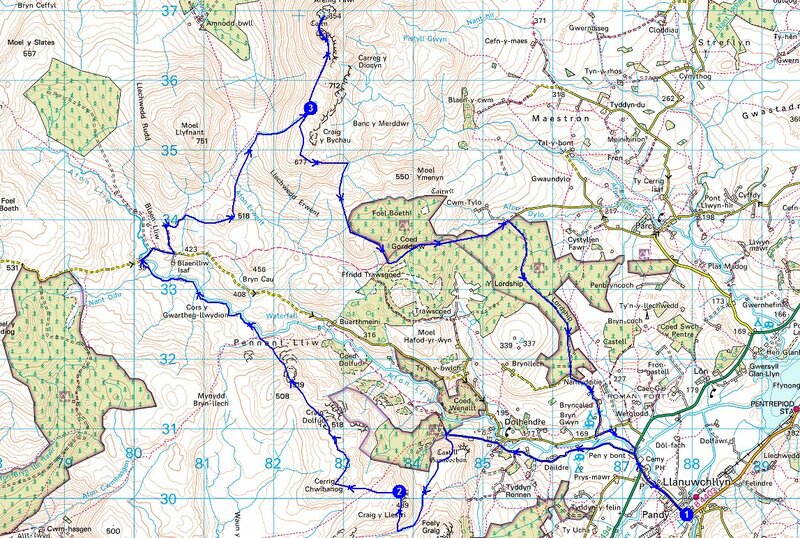 Our route involved a short section of road walking, something that I am not very keen on. It was decided that it would be best to do this at the start, rather than at the end of the day. A layby on the minor road south of Lynn Celyn was a convenient spot to leave the car. The mile or so walk along the road was actually rather pleasant with little traffic. 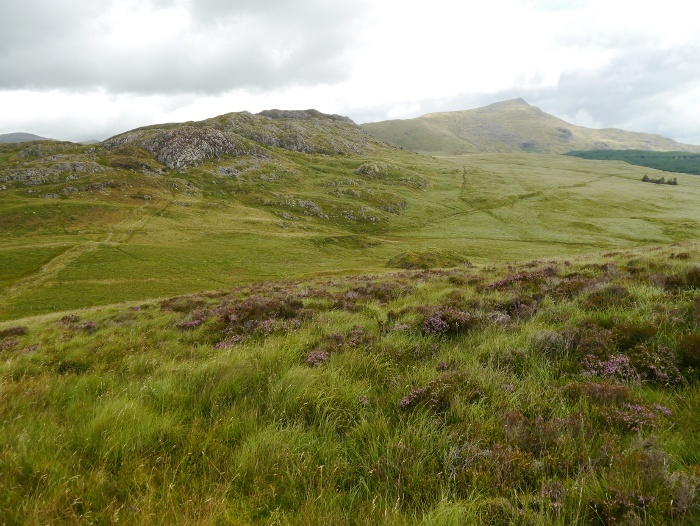 We were soon climbing up the track that leads to Llyn Arenig Fawr. 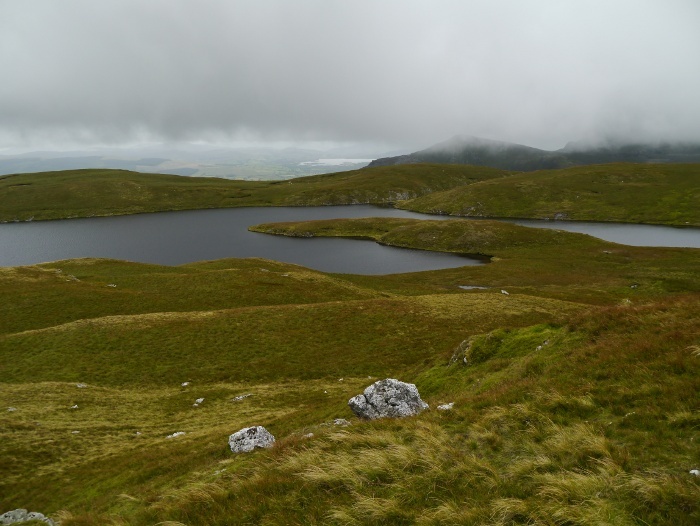 The grassy track was a pleasure to walk on after the initial climb, giving us glimpses of the reservoir nestling below the brooding bulk of Arenig Fawr. 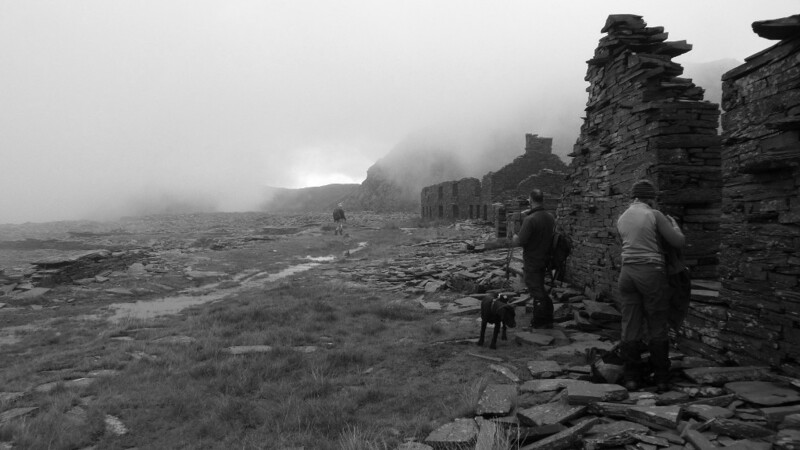 The track then descended gently towards the tiny little MBA bothy. 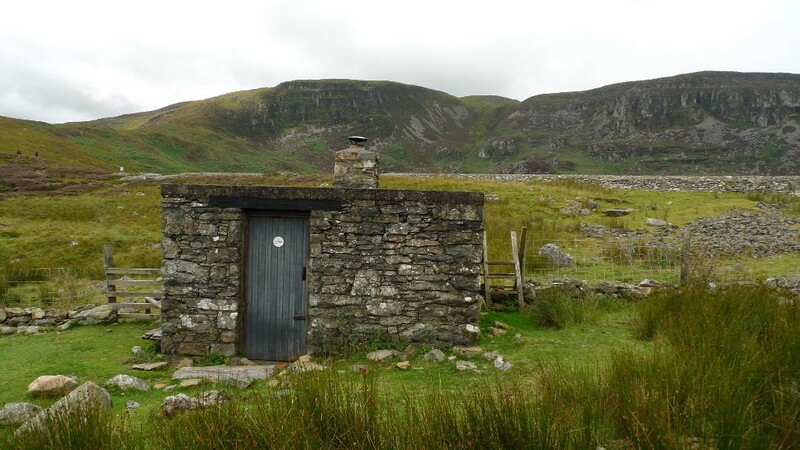 The bothy has a great location underneath the wall of the dam with a line of cliffs as a backdrop. We poked our noses inside and came to the conclusion that it is not a place we would choose to sleep in. There are two sleeping platforms designed for the vertically challenged and a tiny fireplace. There really is no room for anything else. Crossing the stream flowing from the reservoir we joined the path that climbs the east ridge of the mountain. 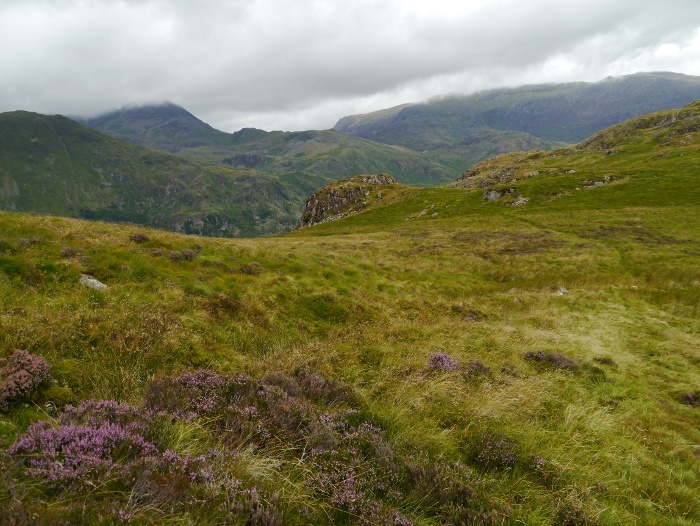 The August colours were at their best, the purple of the heather contrasting nicely with the green of the bracken. We soon passed a couple we had been following since leaving the road. They were Dutch and had a couple of dogs with them which definitely were not under control, we had noticed them some distance from their owners earlier on. Reuben went over to say hello and was promptly pinned down by the larger of the two. No harm done we shrugged this off and after a brief chat climbed further up the hill. 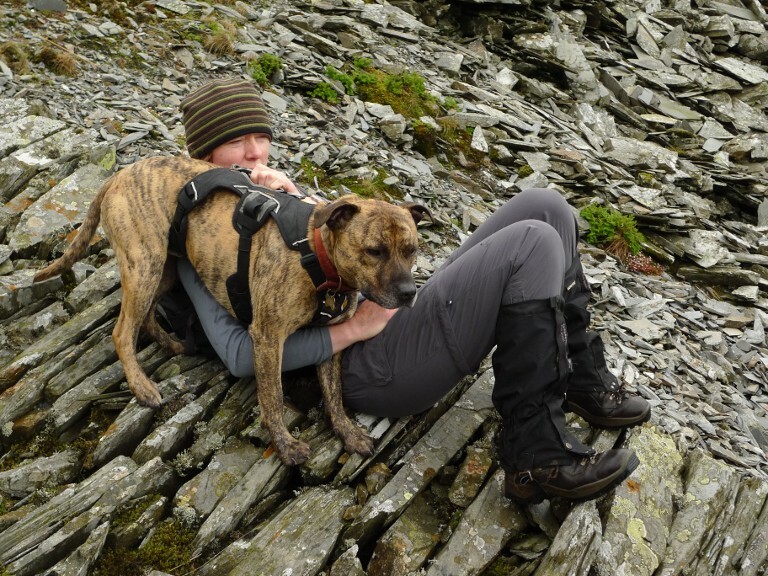 Every now and then Reuben and Dougal would fling themselves to the ground for a quick cuddle. The path that we were following for some reason started to contour the hillside rather than going upwards, we left it and slogged up rough grassy slopes to the main ridge. 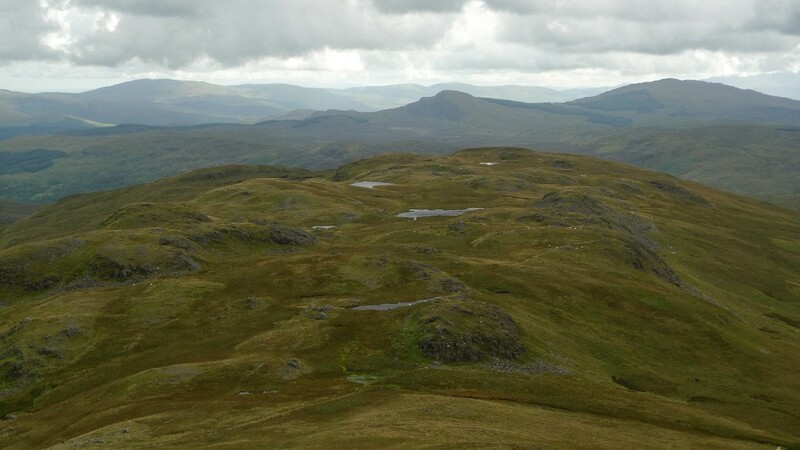 The isolated position of Arenig Fawr and its height provided us with an extensive panorama as we approached the summit. 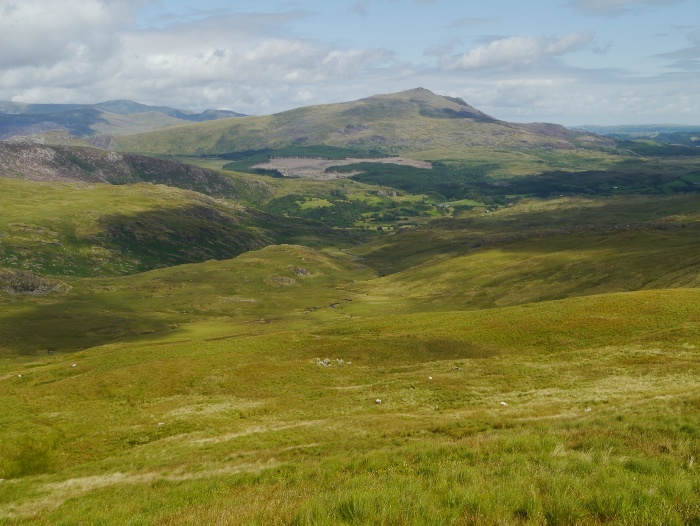 To the north the endless moors of the Migneint were laid out beneath our feet, framing the main Snowdonia peaks. There was a great feeling of space and distant horizons. 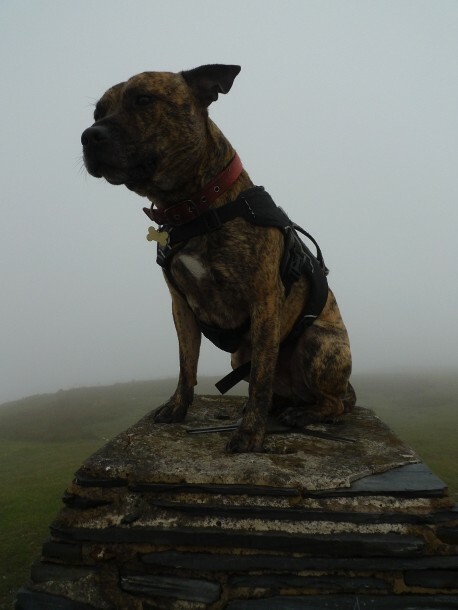 Reuben was happy to oblige with one of his trig point poses, as usual staring wistfully off into the distance. I often wonder what it is he is thinking about at such moments. Lunch was a leisurely affair, sitting behind the substantial stone shelter it felt warm in the sun. 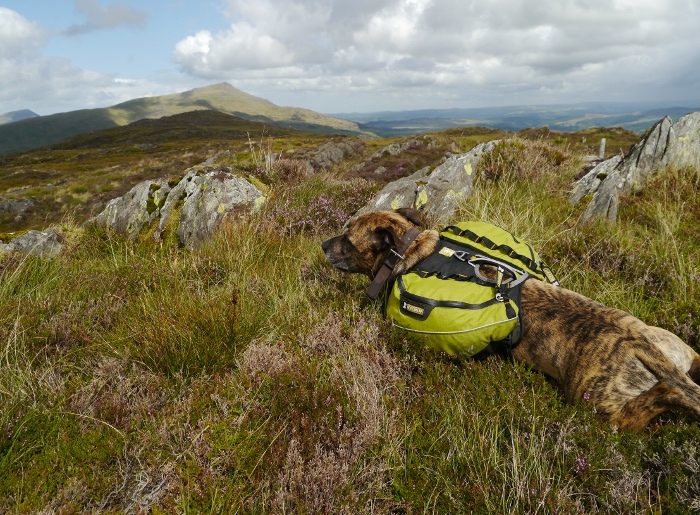 The exertion of the previous day on the Moelwyns and the climb up to the summit appeared to take its toll on Reuben, who was soon laying down with his head on a pack for a rest. Which quickly turned to full on doggie snoring…………. 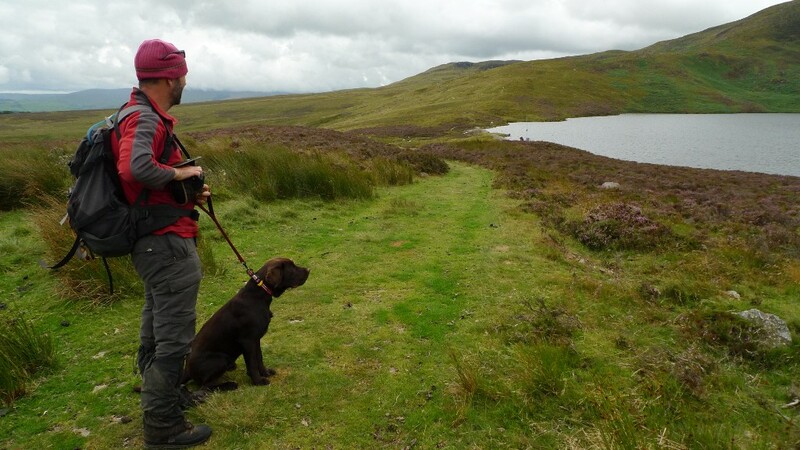 The peaceful moment was soon shattered by young Dougal who spotted a family approach the trig point. For some reason he decided to have a good old bark at them, totally ignoring Pete’s requests that he remain quiet. 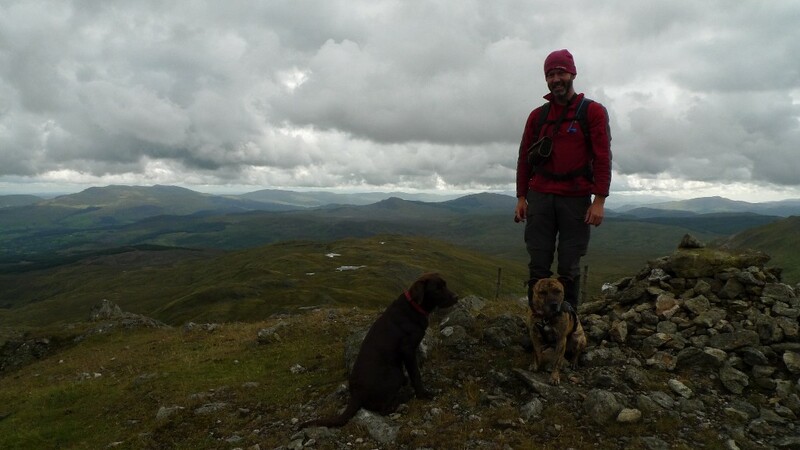 Despite Pete’s apologies the family did not look too pleased and without returning our greetings decided not stop at the summit. The Dutch couple arrived just as we were about to leave, pleasantries exchanged we set off down the excellent south ridge of the mountain. This is a place of real character. 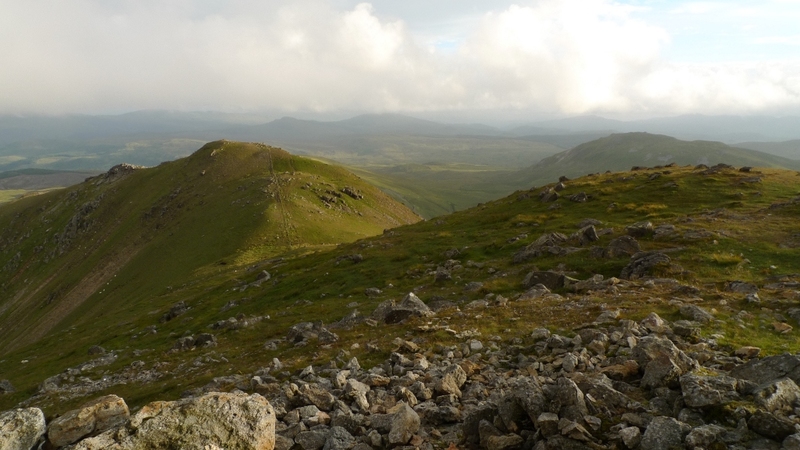 The initial steep and well-defined ridge soon gives way to a plateau of many little rocky knolls and lakes. 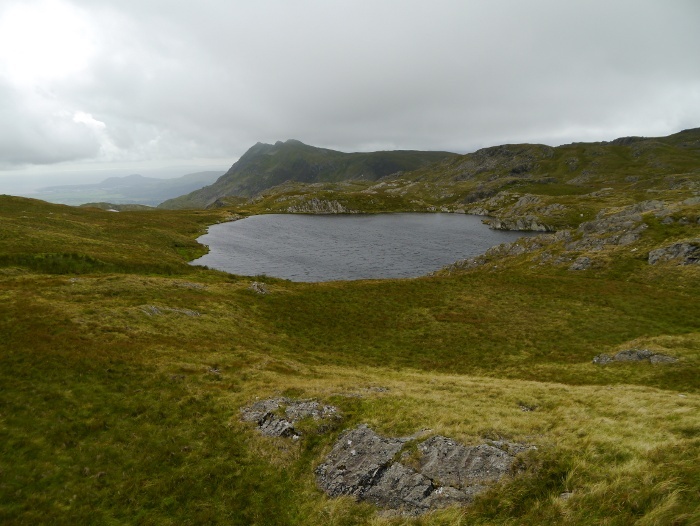 It is a great spot for wild camping, an area where you see few people. 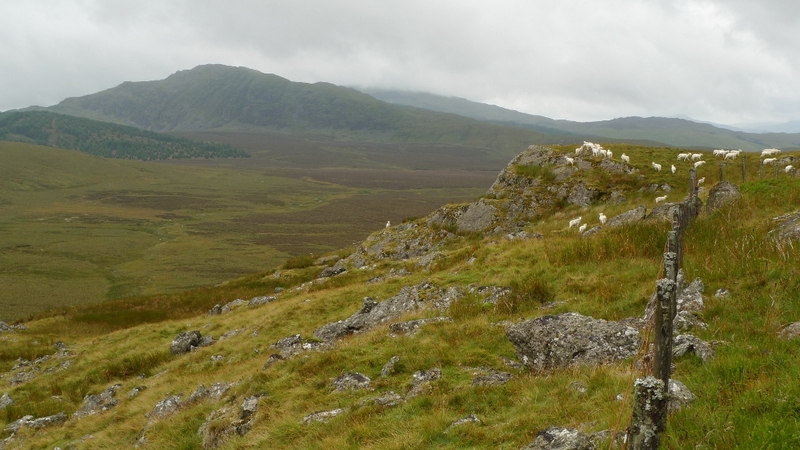 We followed sheep trods weaving amongst the rocky knolls then a fence towards the saddle between Arenig Fawr and Moel Llyfnant. Pete spotted a bit of a commotion coming from just below the summit we had left, it appeared the two dogs had run off from the Dutch couple and were chasing a group of sheep. We though that they would soon give up but instead they managed to separate one and focused their attentions on that. We watched in horror as the dogs chased it further and further down the hill until they finally brought it down. By now the owners were a huge distance away and rather than running after their dogs simply stood there calling them. We used Pete’s binoculars to see what was happening with the sheep which by now was on its back with its legs in the air. Somehow it managed to drag itself up and start running again, the dogs in hot pursuit. Several times it managed to get up after being brought down, running a few hundred metres before the dogs were on it again. The chase finally finished in a sickening manner when the sheep tumbled over a low cliff, bouncing through the rocks below. We noticed that the owners had not really moved and were still near the top of the mountain. We both decided that we should report the incident. We were also aware that we had two dogs with us and were worried that they could be mistaken for the culprits. 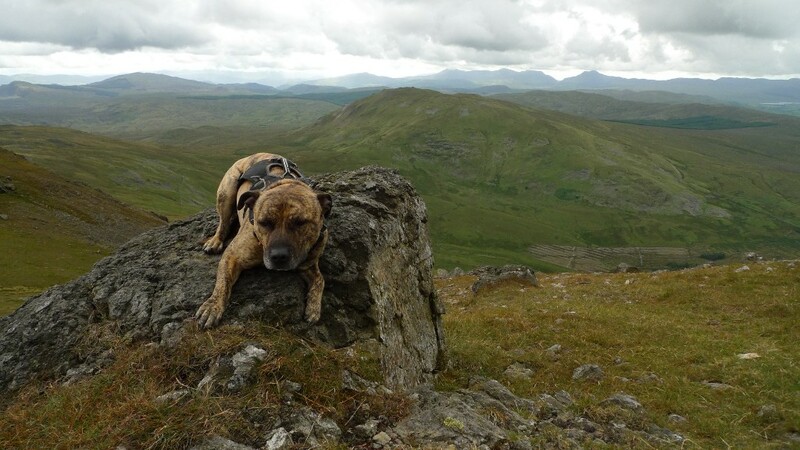 Reuben has got a bit of Staffy in him which Daily Mail readers will recognise as a ‘devil dog’, a killer of everything that moves if you believe the guff often written. I definitely did not want a case of mistaken identity. We stomped on down to the track leading back to the minor road, passing a couple looking up at the cliffs where the sheep fell. We could see the dogs above barking at what we initially thought was the dead sheep, it made my stomach turn to see it was still moving. After a quick chat with the couple about what we had seen we made quick progress to the road and flagged down a likely looking vehicle. The guy inside knew the local farmer and made a quick u turn to inform him what had happened, armed with a good description of the couple, their dogs and where their car was parked. 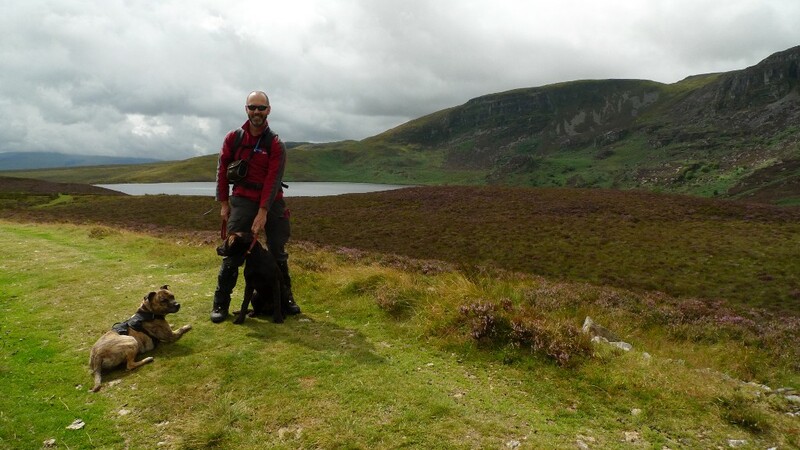 We arrived back at the car, an enjoyable day in the hills marred by the ugly incident. Reuben and Dougal were completely unaware of the drama that had taken place and were soon cuddling up on the back seat. The tractor driver was totally oblivious to the increasing number of cars building up behind him. On and on he went, down twisty country roads and through villages. There are worse places to be stuck behind a tractor than the Tanat valley, a land of lush green hills. Fiona was at the helm of the vehicle and showed remarkable patience at driving at 15 mph for what seemed to be an eternity. I had been invited to stay at a cottage belonging to friends of Fiona and Pete whilst the owners were away on holiday. A more idyllic place I cannot imagine, a beautiful Welsh cottage surrounded by barns, chickens and a large veg patch. Each evening I kept expecting Hugh Fearnley Shittingstall to walk into the kitchen clutching all manner of greenery and start cooking on the Rayburn. 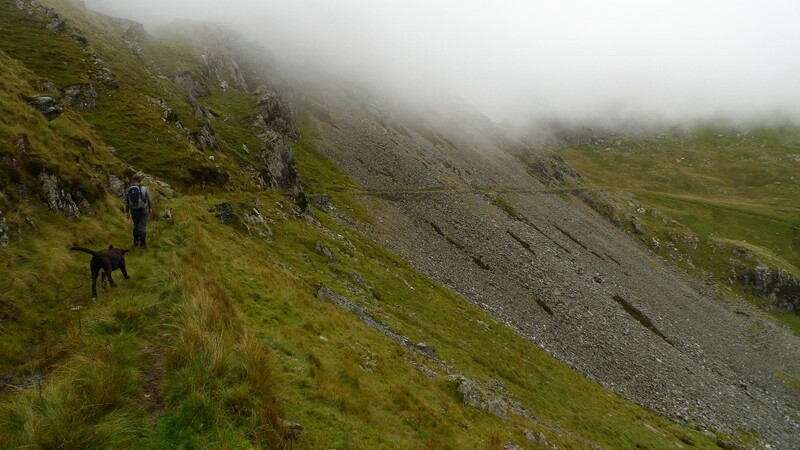 Within minutes of leaving the car we were in the mountains, an old track taking us into Cwmorthin. 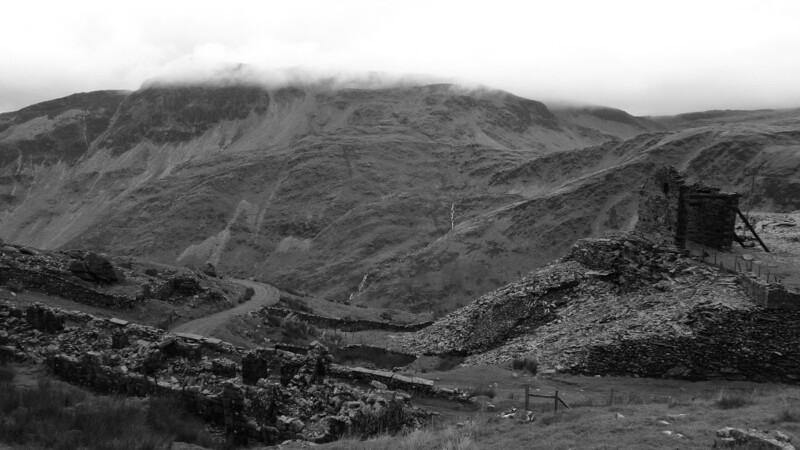 Here past industry has not been kind to the landscape, slate mines disappearing into the clouds on both sides. 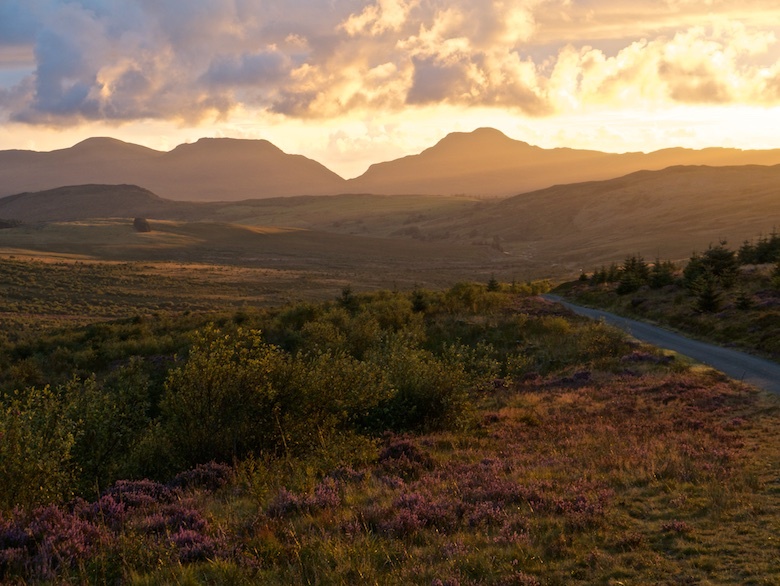 However there is a grandeur to the place, there is no mistaking that you are in Wales. Dougal the nine month old chocolate lab found an old quarry pool to dive into, Reuben watching him from the safety of the bank wondering what he was doing. Approaching the shore of Llyn Cwmorthin a couple of off-road motorbikes noisily made their way up one of the old quarries, adding an element of menace to the broody air. Peace was soon restored and we contemplated the lovely reed lined lake, eyeing up a couple of buildings that would make a superb weekend retreat. 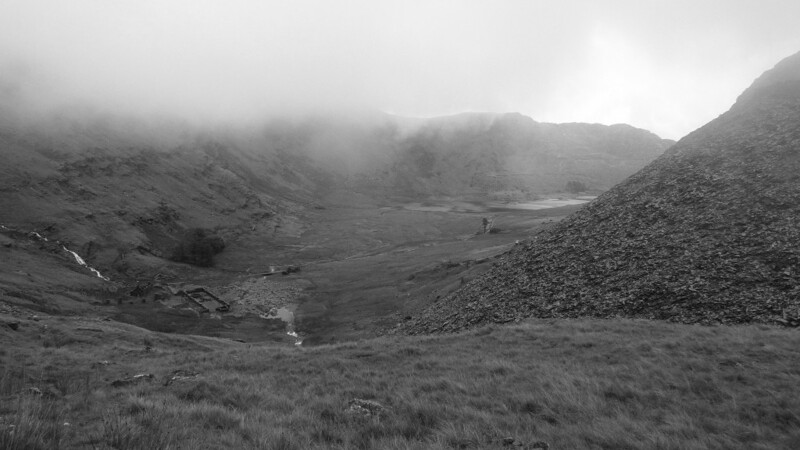 The track lead us easily towards the head of the valley which was hidden by low clouds. The fence alongside was made up of large slabs of slate, looking a bit like gravestones. A great use of the plentiful local resources. 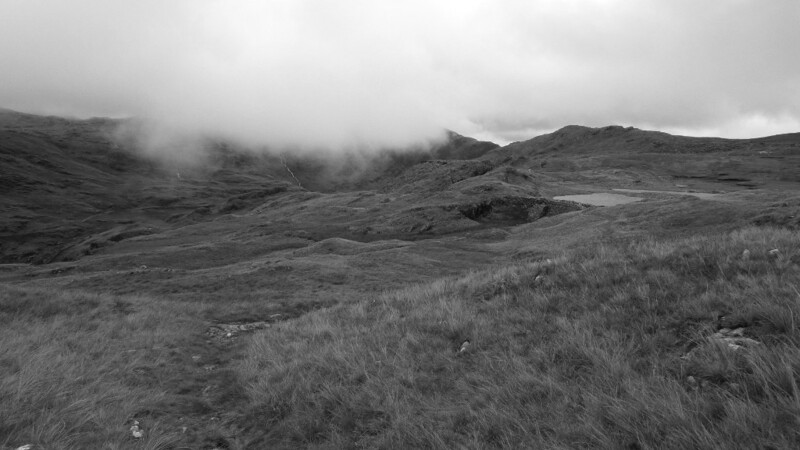 The track continued into the clouds into a darker more sombre world, views coming and going as mist swirled around us. 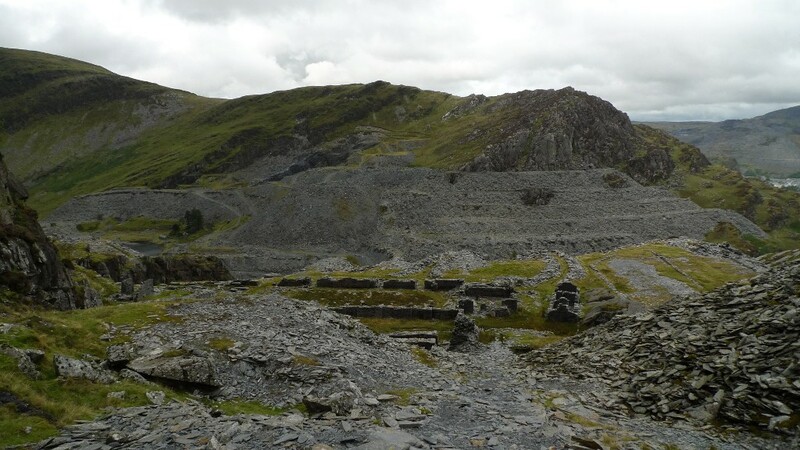 The higher we got the more of an impact the slate mines had on the landscape. 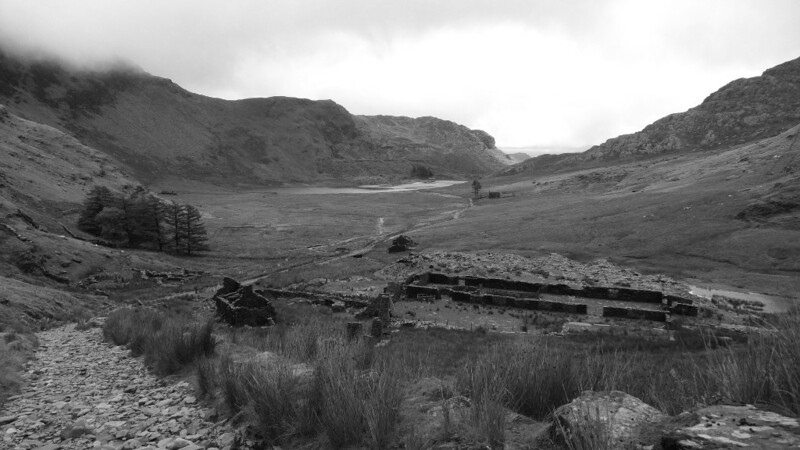 The old barracks of the Rhosydd quarry were quickly reached. For some reason not clear even in my own mind, this is one of my favourite spots in these mountains. I can remember descending from the hills to the north several years ago, finally dropping out of low cloud that had plagued my day making navigation difficult. 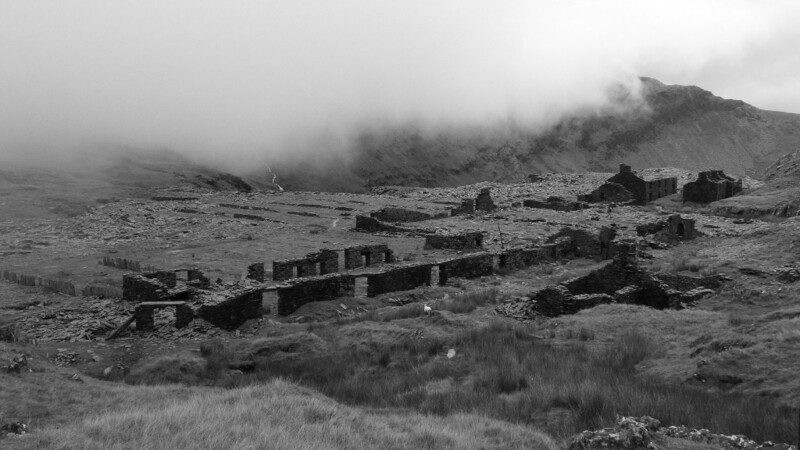 The scene in front of me was eerie to say the least, cloud just drifting above the tops of the ruined buildings. It was like something out of a film set, I could almost imagine dark figures peering through dark frameless windows, shuffling out of view. Back to the present, we found a spot out of the wind for a bite to eat, each of us regretting not bringing a flask of coffee. The only two walkers we were to see all day appeared through the mist like Gore-tex clad ghosts, before quickly disappearing. The surrounding hills were reluctant to show themselves and I was beginning to feel a bit apprehensive about the next bit of the route. These hills can be tough when you cannot see where you are going. I did not want the embarrassment of getting ‘temporarily misplaced’ with other people in tow. Indeed I did fail to locate the exact line of the right of way as we headed away from the shells of the buildings, they look just as eerie from above. I don’t think that I could wild camp on my own in this area. 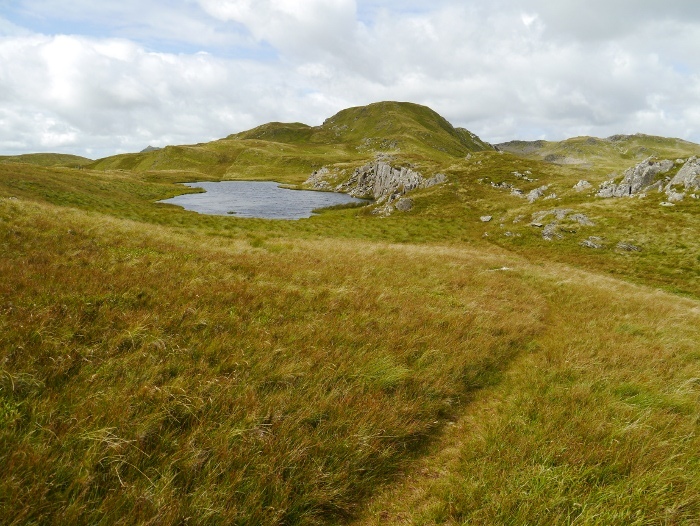 The narrow path was soon located further uphill and we followed it past Llyn Croesor as it weaved its way amongst small boggy knolls. 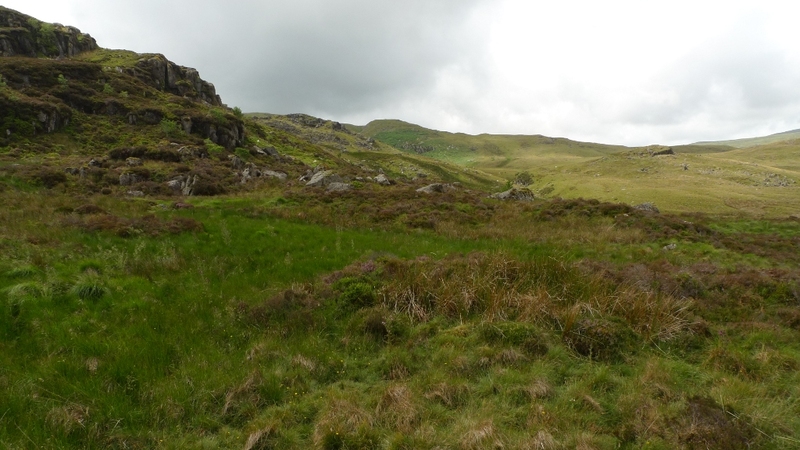 I was relieved to reach the disused Croesor quarry as I had done the following section of the route before. The cloud was beginning to lift a bit now and we began to get glimpses across the deep valley of Cwm Croesor towards Cnicht, the Welsh Matterhorn. From this angle it is simply a large wedge, craggy slopes falling steeply into the valley below. A drystone wall was to be our guide for a while as we contoured pathless slopes to reach the western ridge of Moelwyn Mawr, still firmly hidden in the clouds. Crossing its shoulder an old mine track is reached, contouring around the side of the hill. This gives a simply lovely promenade, the grassy track is completely level, giving the easiest walking of the day. Every now and then we were treated to glimpses towards the coast far below. 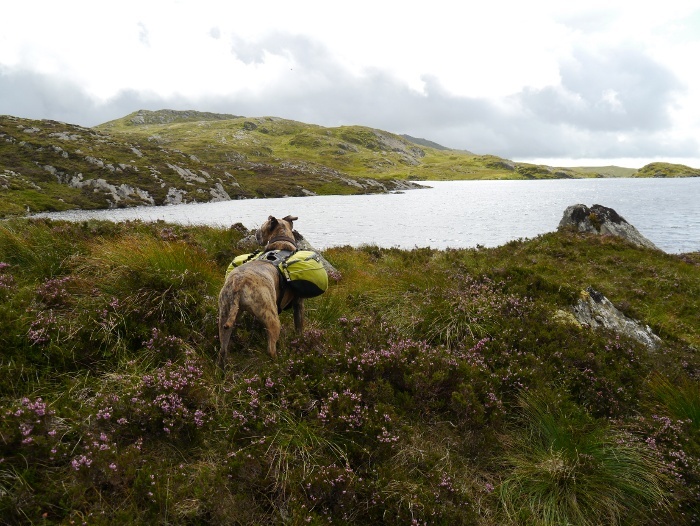 Sadly the track soon came to an end when we reached another disused quarry, there appeared to be no way ahead. Reuben decided it was the right moment to give Fiona some Reuben love. A bit of scrambling up through piles of shifting slate and we located another narrower track contouring the steep hillside. This is the sort of walking that I love. 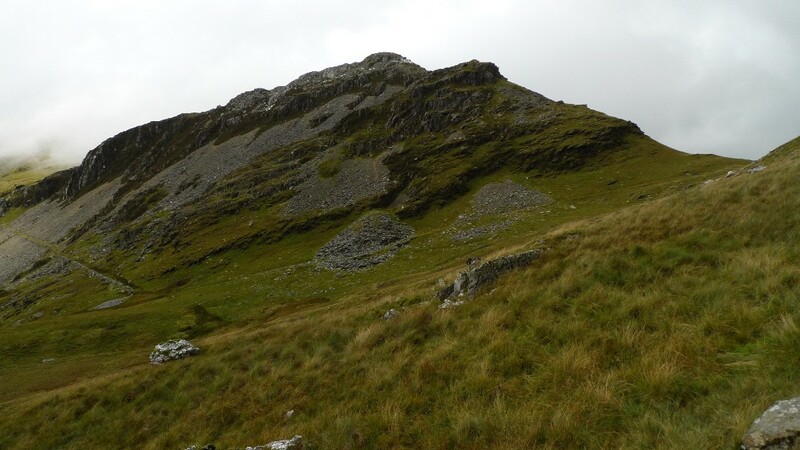 Moelwyn Bach was now looming above us, rather than do a there and back using the path up its rocky nose we contoured a bit to climb its grassy southern slopes. Craigysgafn briefly revealed itself, giving us an idea of the route still to come. 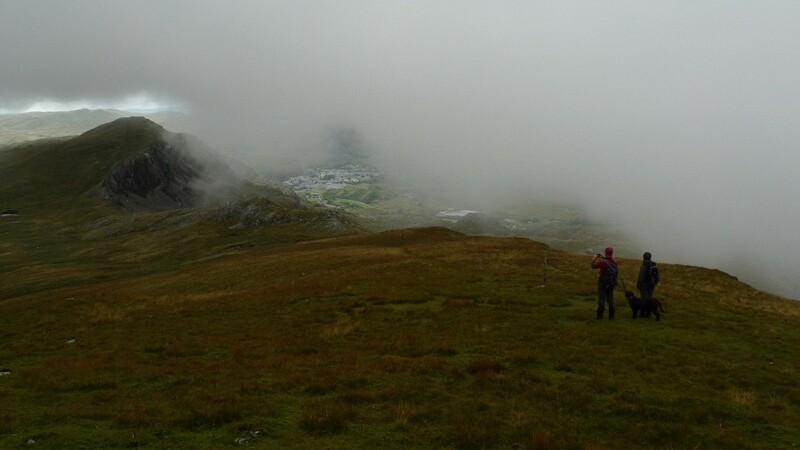 On the summit of Moelwyn Bach the mist played games with my perception as we reached the cairn. A spot a hundred or so metres away looked higher so we duly walked over to it, when we reached it and looked back it was clear that we had walked downhill. We passed the same hikers spotted earlier as we made our way down the steep path to Bwlch Stwlan. Craigysgafn gives a good rocky climb up its ridge with excellent views, not this time however. 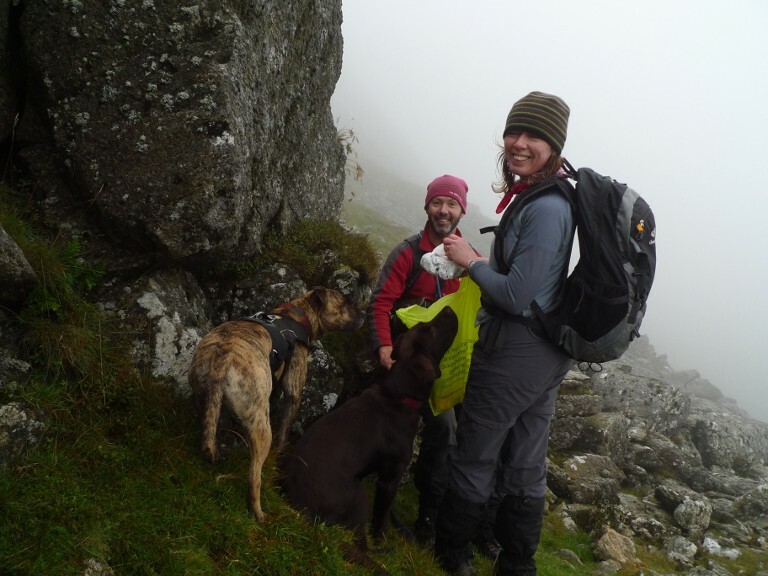 A large boulder gave shelter for some food for the humans whilst the dogs looked on with hungry eyes. 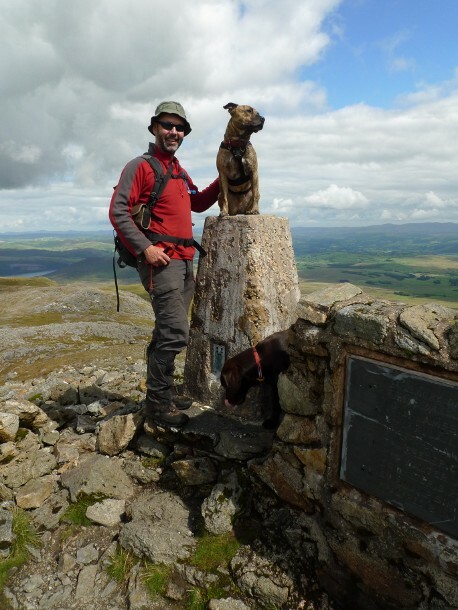 Reaching the trig point on Moelwyn Mawr, the highest point in these range of hills Reuben was ‘encouraged’ to do his usual pose. It took a bit of persuading this time, he has now got wise to my intentions. 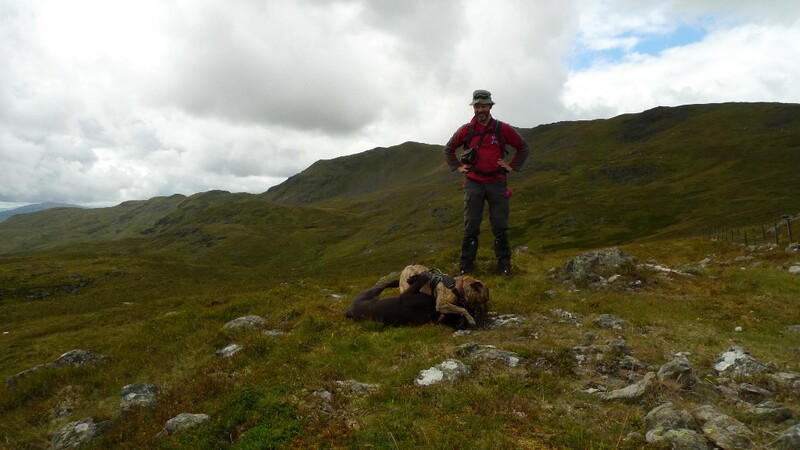 Dougal was briefly subjected to the same humiliation before we headed off on a compass bearing to locate the right ridge. I love it when you suddenly drop below the cloud line, colour coming back into vision after a while surrounded by grey. 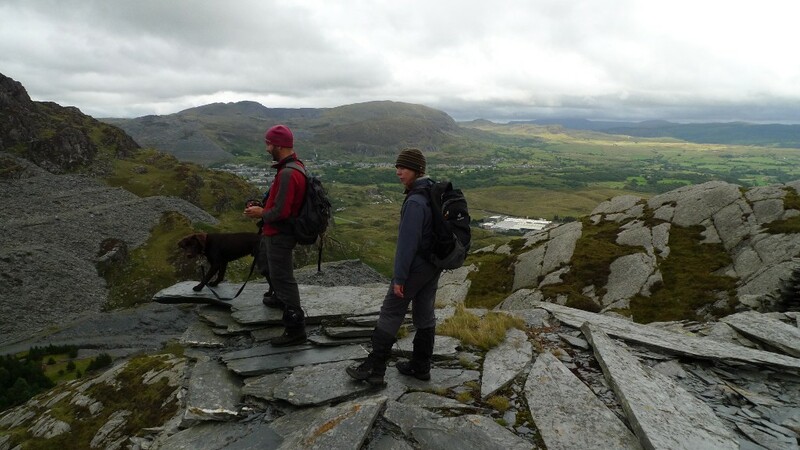 In front of us was a high plateau with the Rhosydd quarries in the distance. 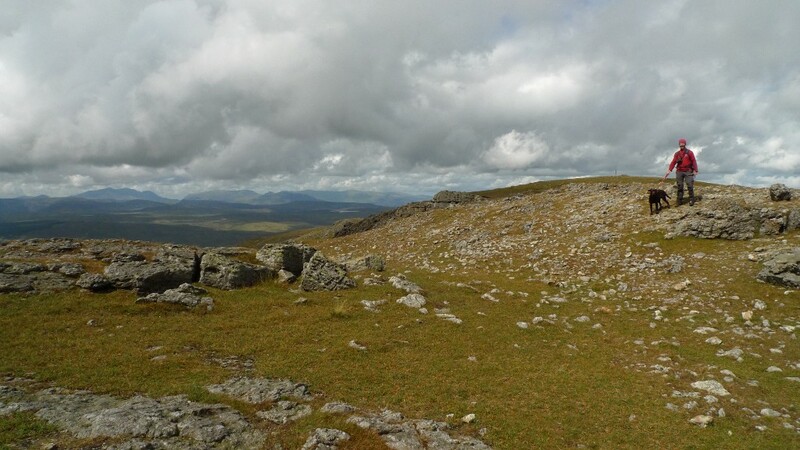 This area is dominated by two massive holes carved into the moorland, a place of danger to be avoided on this walk (they are well worth a peek into if you are into big holes). 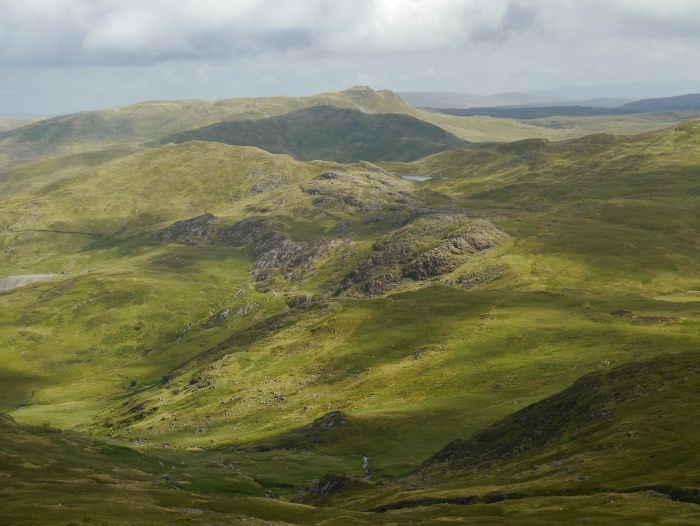 We followed a narrow path along the edge of the mountains, getting fleeting glimpses of Blaenau Ffestiniog far below. The drifting clouds really adding some drama and perspective to this part of the walk making us feel much higher up than we really were. 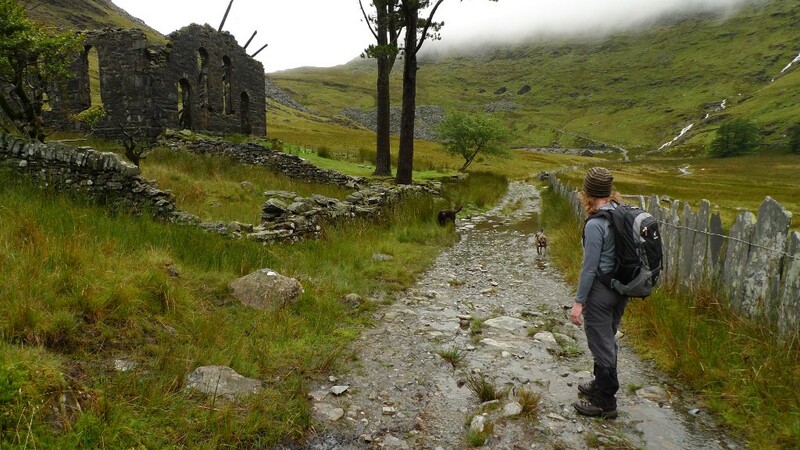 The footpath back to the car was found and then lost (I alway loose this path) but we happily drifted north to Llyn-y-Wrysgan and then another large disused quarry. It was here that we heard voices coming out of a passage carved into the hillside. Going to investigate we soon found ourselves in a large chamber filled with a couple of groups of people. It was hard to make out exactly what was going on but it appeared that everyone had a can of beer in their hands, had we stumbled into the local party cave? Reuben went off into the darkness to make friends, whilst Dougal barked at the shifting shapes. We had now well and truly lost the planned route down so continued working our way through the various inclines, until suddenly we came to the edge. 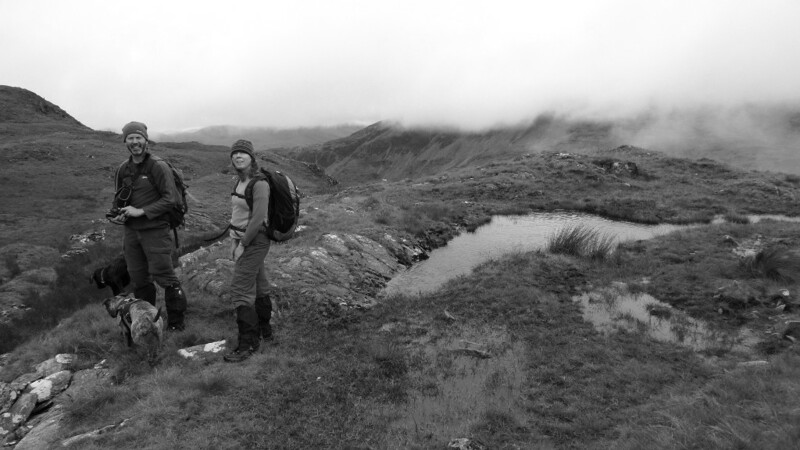 Instead of backtracking we gingerly made our way down what we initially through was a path through the spoil heaps. It wasn’t and we ended up on slowly shifting lumps of slate before quickly exiting onto rough hillside to pick up our outward route. 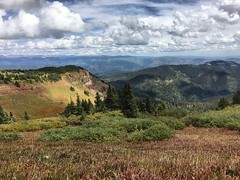 Although we had walked less than eight miles, all of us felt like we had done a big mountain day when we got back to the car. A great day in the hills. I sometimes can find choice overwhelming, for instance put me in a supermarket and ask me to choose a packet of biscuits. My brain sort of short circuits and I have to ask my partner for help. It’s either that or pick up some fig rolls, the cupboard is always full of fig rolls. 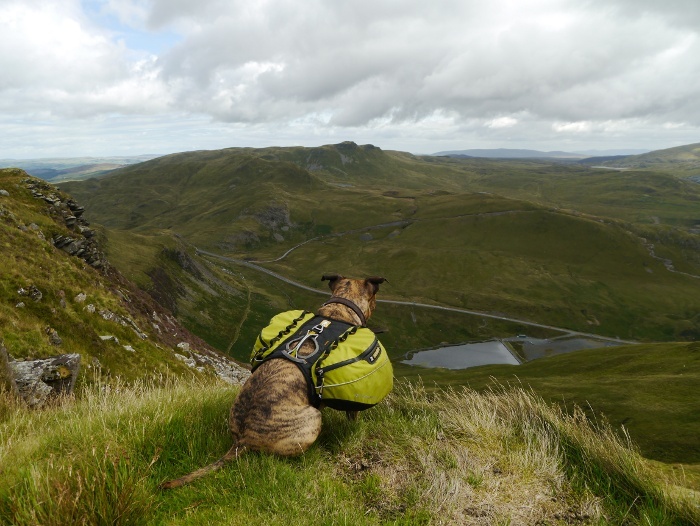 The same could be said for the hills in Britain, it can be a difficult task trying to make up your mind where to go for a weekend backpack. Distance needed to drive narrows things down a bit, I can stomach a 3 or 4 hour drive either way for a weekend in the hills. That still gives a good variety to choose from, most of Wales, Peak District, Yorkshire Dales, North Pennines and the ‘near’ bits of the Lake District. In fact that does not narrow things down very much at all as it only really excludes Scotland. 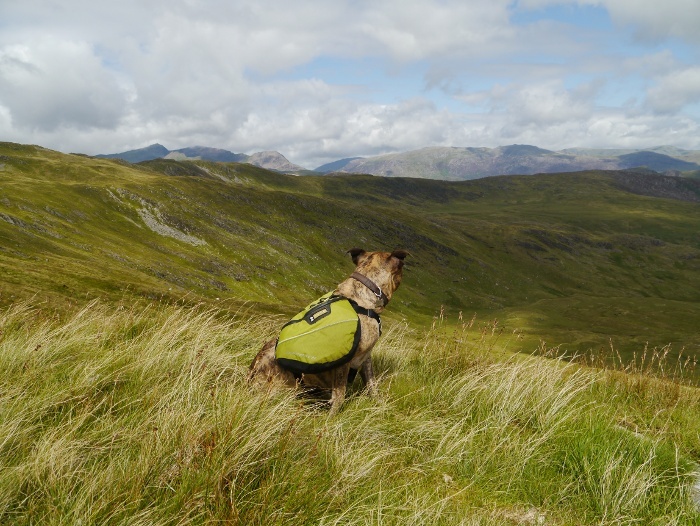 I settled on a backpack around Kentmere in the Lakes in the end, mapped it out and everything. Then the weather changed, then it changed again. In fact the weather forecast really could not make up its mind. I ended up going to work on Friday morning with my backpacking rucksack all packed and a pile of maps. I would check the forecast at lunch time, meet Rae and we would then decide where to go. Two minutes before setting off we decided to head for Snowdonia as the weather seemed to be the best there over the weekend. 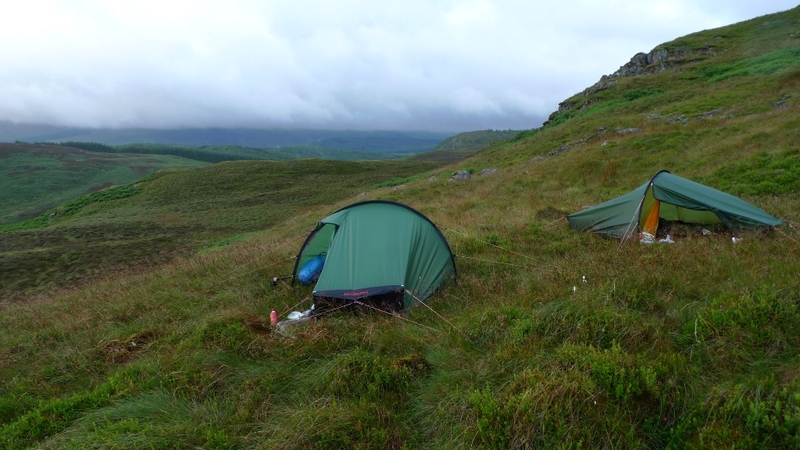 I fancied a wild camp on the southern ridge of Arenig Fawr after reading a trip report of Geoff’s blog. 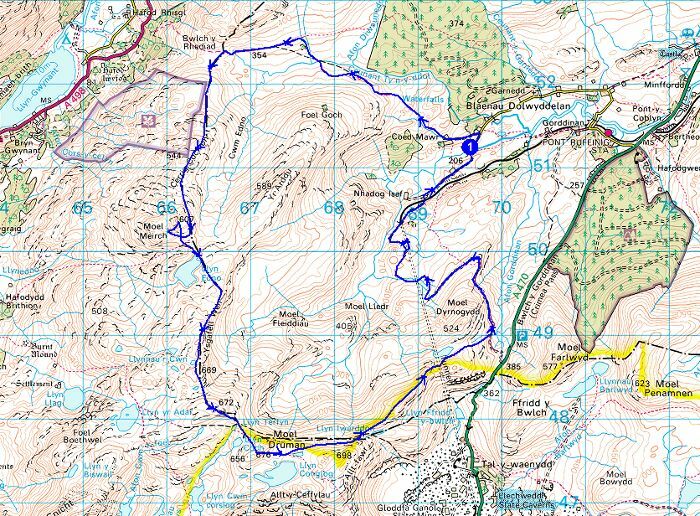 A scan of the map showed a rough route, we could make up the rest as we went along. 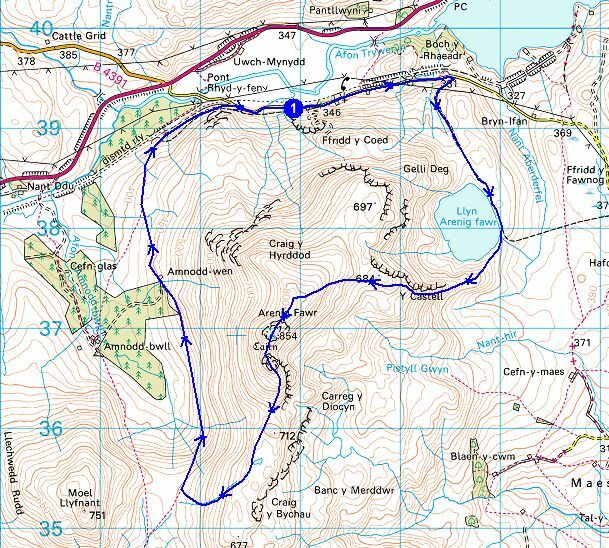 Here is a full map of the route we walked in the end, our wild camp spots are marked as points 2 and 3. Leaving was delayed by an hour as a curry was needed to fuel us for the drive to Wales. The Indian community centre in Nottingham serves up a lovely thali for £3.70 (curry, dhal, rice, salad, chapati, curd and desert) at lunch times. Well worth a visit. We arrived at Llanuwchllyn at about 5.30pm and parked up in the deserted car park at the far end of the village. I could have parked nearer on the lanes around Dolhendre but I fancied the security of leaving the Bongo close to houses. Llanuwchllyn is a long strung out village and it is a fair walk back to the main road where we picked up a minor lane that leads to Dolhendre. Near to the lane that crosses the river there was a bit of a commotion going on with loads of parked vehicle and big group of kids and adults. We left the noise behind and continued ahead with the lane soon turning into a track. We stood for a while looking at the very brown raging stream of the Afon Fwy and did not notice until we turned around that the large group was now heading up the track we planned to follow. There must have been at least 30 in the group, half adults and half very energetic children. We got tangled up in the middle and stopped to let everyone pass, as soon as they passed us they stopped. We resigned ourselves to walking in the middle of a large crowd. More akin to being in a shopping centre than a damp Welsh hillside at 7.00pm on a Friday evening! It was obvious that they were heading for the ruins of Castell Carndochan where we had planned to camp. Instead we continued along the track (not marked on the map) further along the ridge to look for a spot for the tents. Unfortunately the green grass was covered in thistles and we realised that there were cows fenced in with us. Time to continue ahead and hope a reasonable spot turns up. 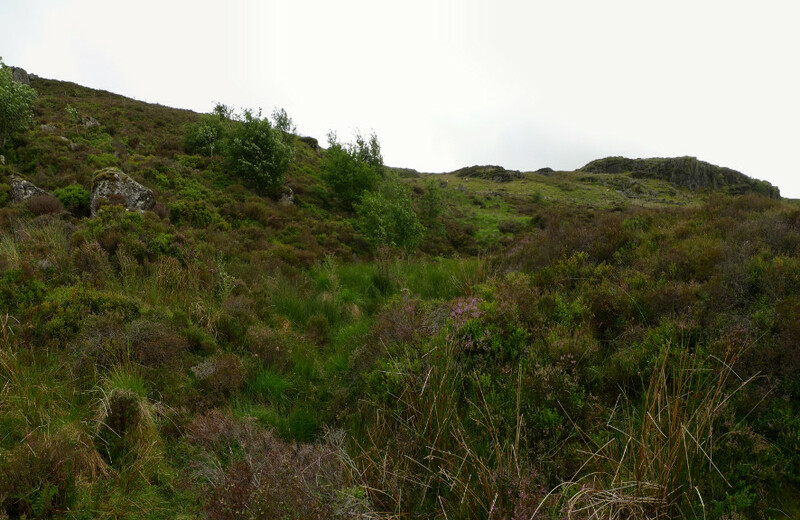 As we headed up the banks of the Afon Fwy the ground turned to saturated bog and then deep heather and bracken. The bridge marked on the map actually existed but was a risky affair made of very rusty corrugated iron. 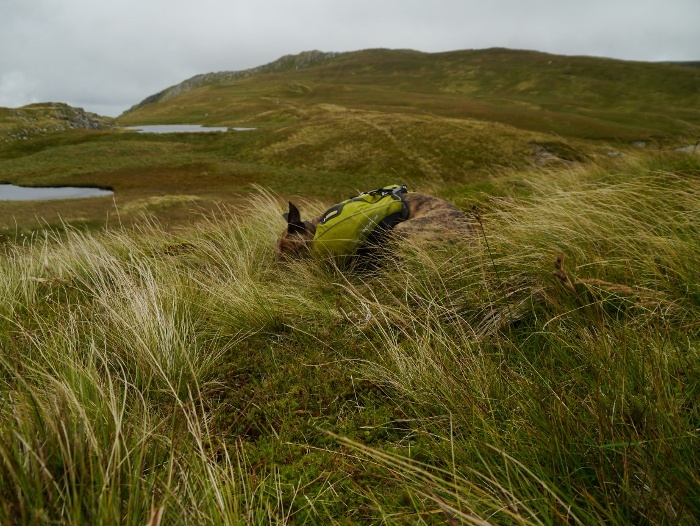 We got across safely but began to despair of finding a place for the tents, the ground was either bog, deep heather or tussocks. To add to the bleakness and the sense of despair it started to tip it down with rain. After a bit more rough walking we gave up with the valley bottom, filled our water bottles and headed up hill. 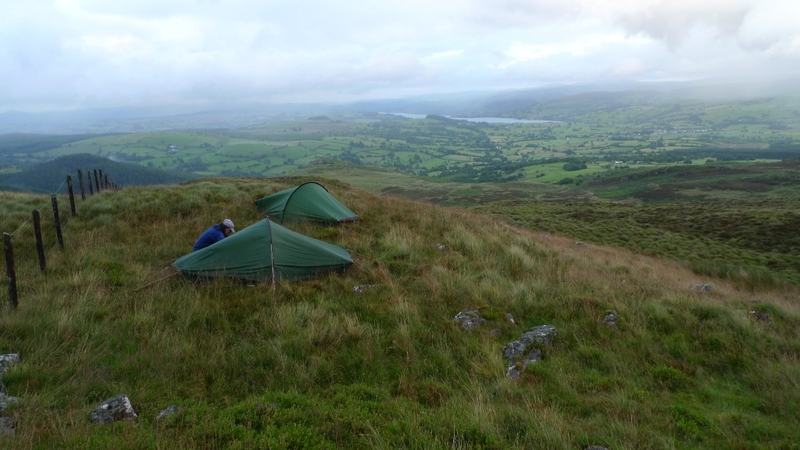 Thankfully we found a patch of soft springy grass that was nearly flat and got the tents up. There were great views that evening of clouds sweeping across the valley below. During darkness streetlights twinkled below giving a feint orange glow. I slept well that night. It was a wet night and still raining in the morning when I got up and cooked breakfast, the hills on the other side of the valley were hidden by a cap of cloud. The weather forecast had promised sun by late morning but it looked pretty doubtful. We packed away wet tents that morning. 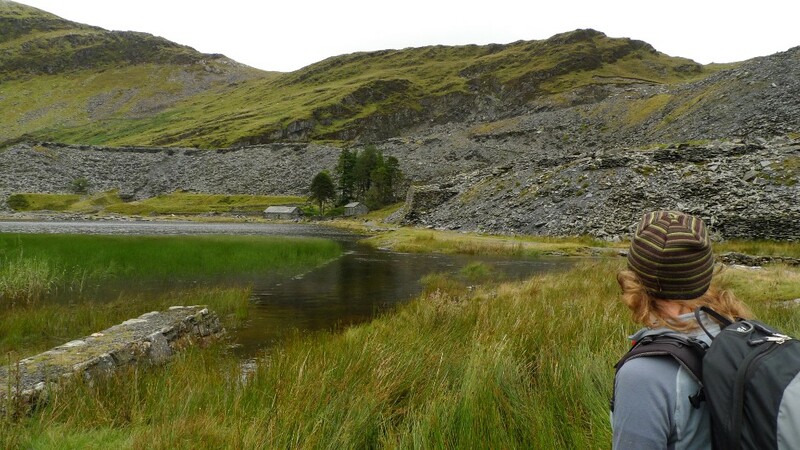 The plan was to walk the high ground on the west side of the Afon Lliw which would take in a couple of Dewey tops. Approaching Cerrig Chiwibanog we were passed by a flock of newly sheered sheep who looked uncharacteristically white and clean. 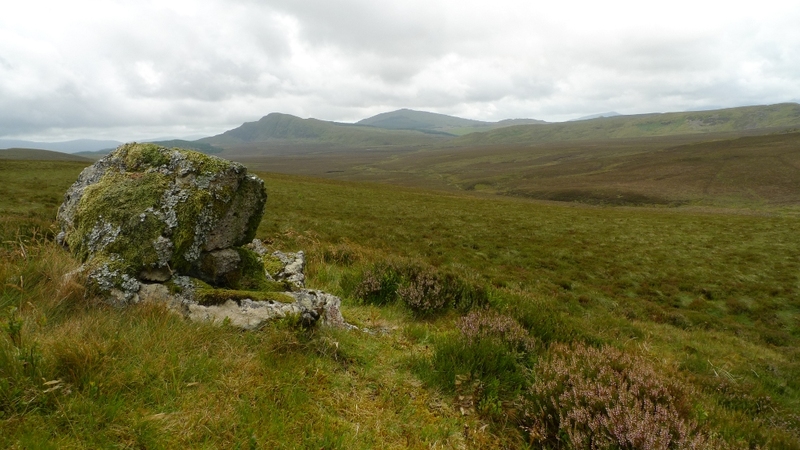 The rocky summit of Dduallt was now clear across the vast expanse of bog called Waun y Griafolen. 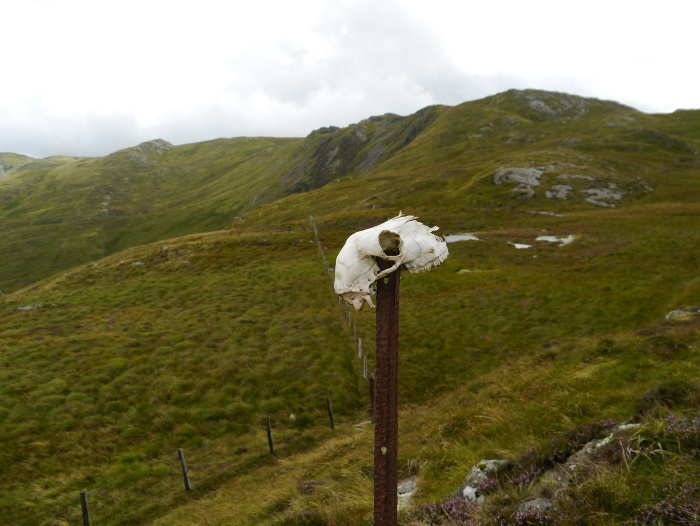 The rough summit had a fenced off area which had a large patch of flowers surviving amongst the bleakness. Anyone able to name them? 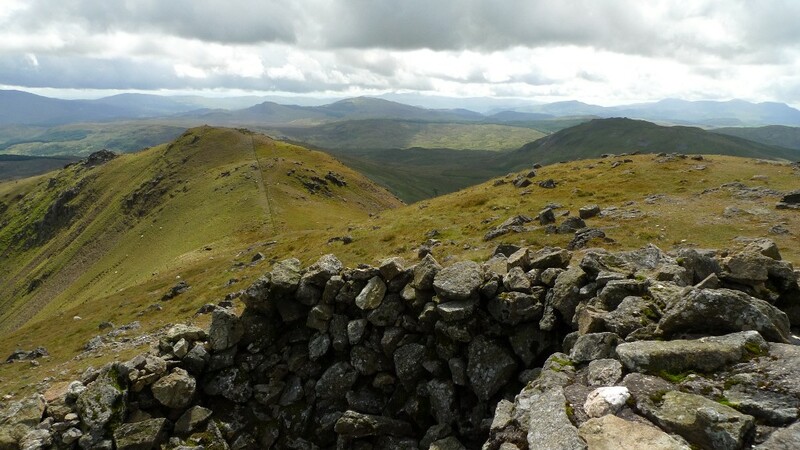 We found it easier to follow the eastern edge of the wide ridge where the terrain was less tussocky, the route ahead was punctured by well built old cairns. 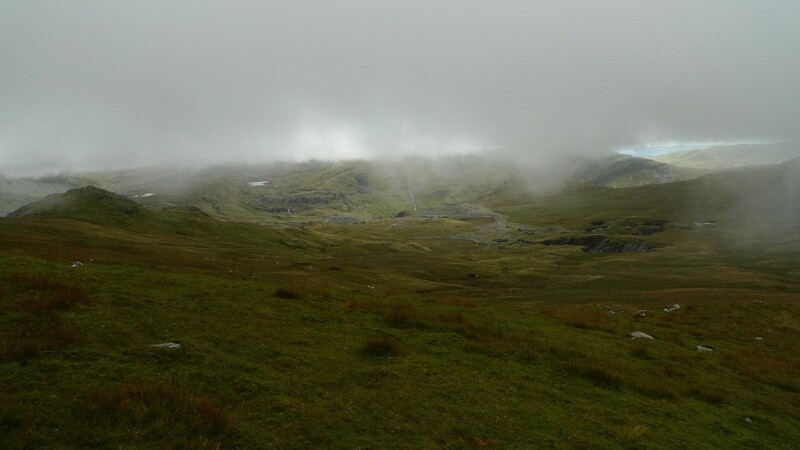 Although it was now far from sunny the weather had improved dramatically and the high peaks of Arenig Fawr and Moel Llyfnant were now clear of cloud. 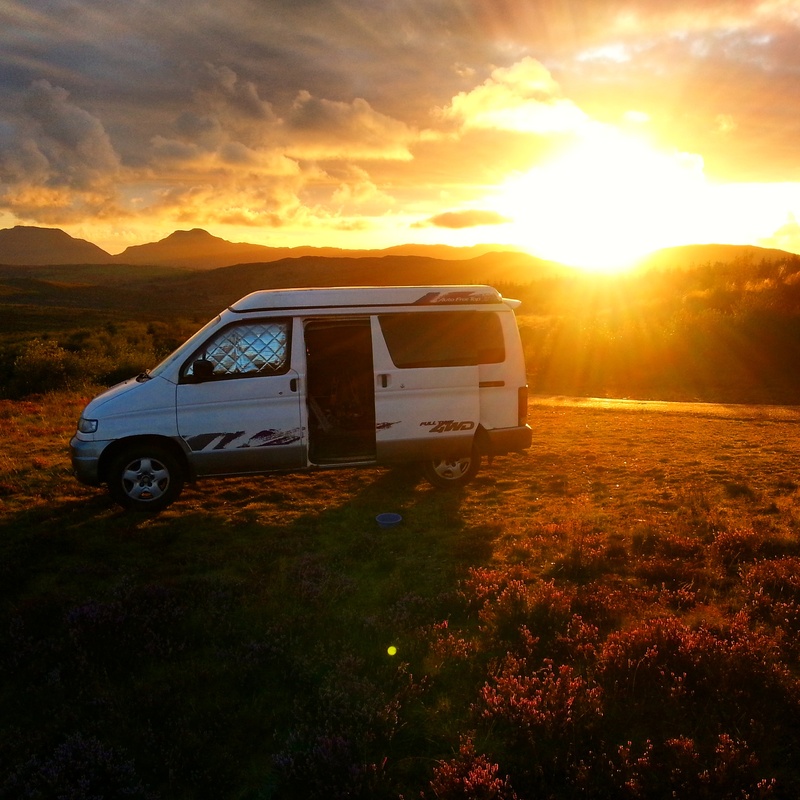 We had our fingers crossed for a sunny evening relaxing on the south ridge or Arenig Fawr with wet tents drying out in warm sunshine. 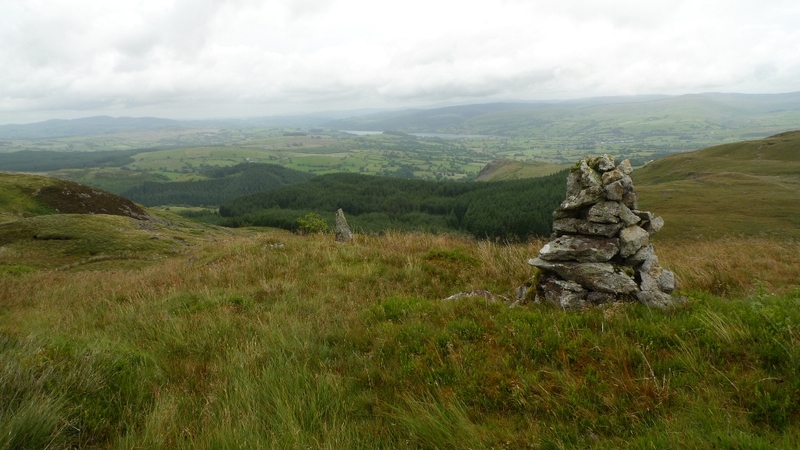 Just before the last minor summit of Craig Dolfudr north top there was a good view showing just how vast the bog of Waun y Griafolen really is. It is not area I would like to cross on a wet misty day! 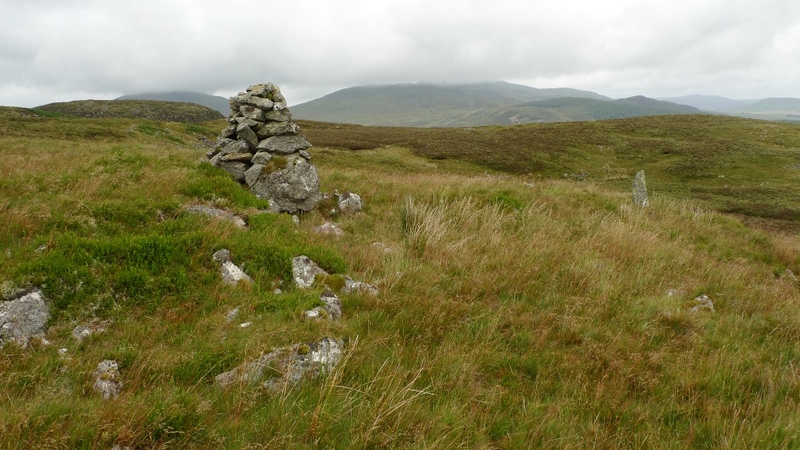 The grassy summit which has a small cairn gives a wild and rugged panorama and we could see the length of the upland valley we would be walking up, the next couple of miles would be either very flat and easy or a land of frustrating bog and vegetation. It’s hard to tell these things sometimes just by looking at a map. The first section turned out to be a bit of a nightmare. 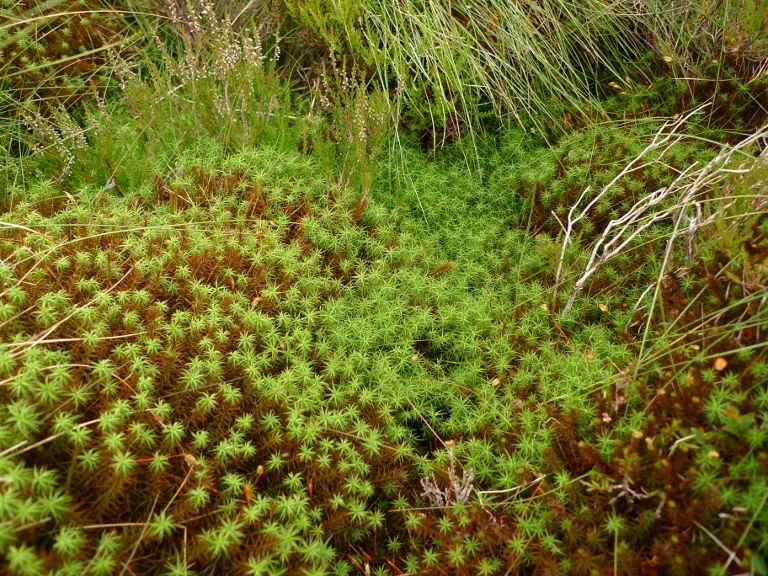 The terrain soon turned very heathery with large springy patches of spagnum moss, which is pretty interesting when you get down close to it. 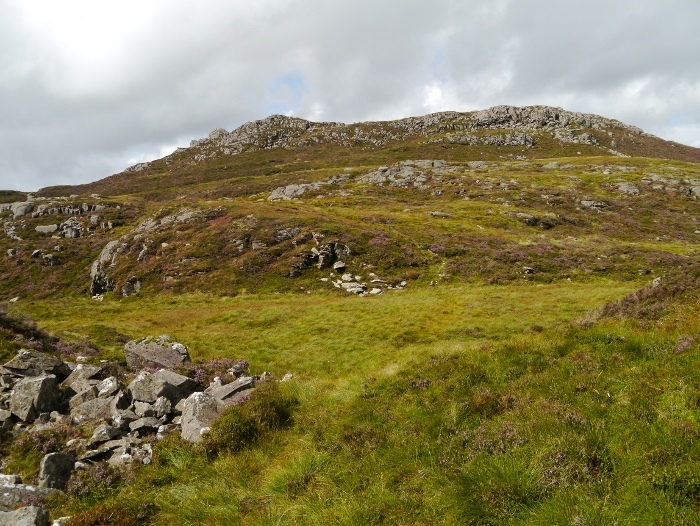 The further we descended the deeper the heather got, at times it was up to our waists and the steep slopes hid many holes among the vegetation. Progress was slow although the surroundings were very scenic with all that plant life, small trees and outcrops of rock. We were glad to finally arrive on level ground. However the ground beneath our feet got no better and after deep tussocks our way was blocked by quaking bog, the ground wobbling all around like a giant blamonche. Finally after following the river bank for a few hundred metres we found ourselves walking on beautifully cropped grass and the going was easy following a great upland river. 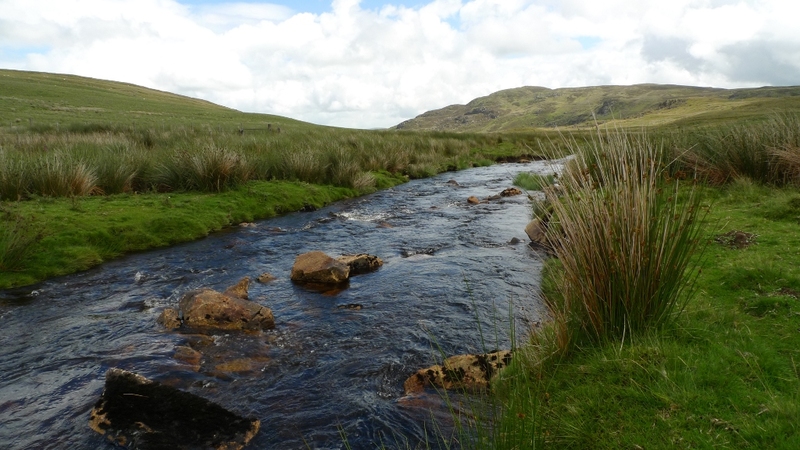 We soon intersected a narrow mountain road which enabled us to cross the deep fast flowing river and start the long climb up Arenig Fawr. 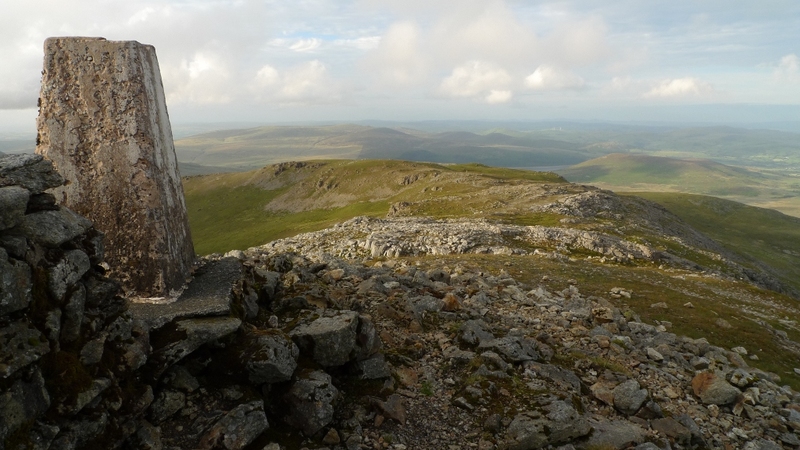 Being an ardent peak bagger I could not resist the small rounded top of Foel Ystrodur Bach which is listed as a Dewey. Steep grassy slopes alongside a small stream meant we quickly gained height, filling up our water at the head of the stream. 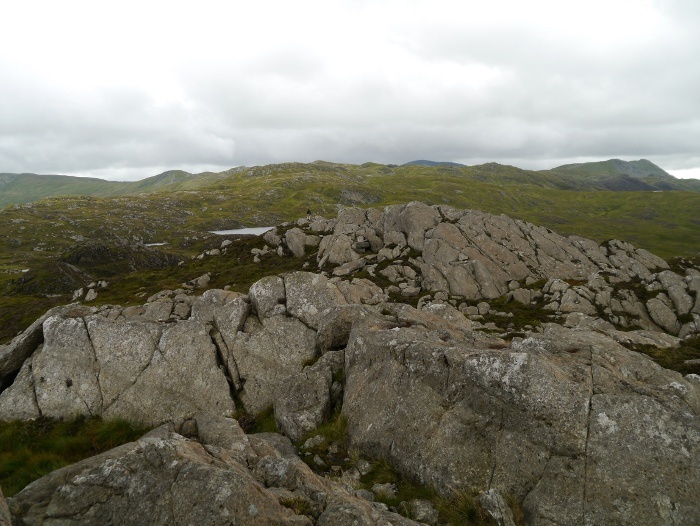 The south ridge of Arenig fawr is a wide complex affair with lots of small tarns and rocky outcrops. We pitched our tents with a bit of shelter from a small rise and left them to head to the summit. We climbed a fair way before my eyes could no longer make out the tents behind us. 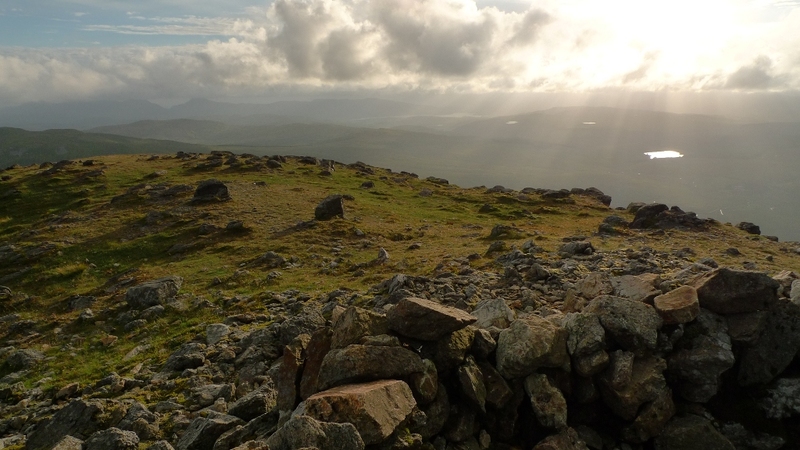 The sun finally came out on the cold windy summit, giving a fine evening glow to the surrounding hills. It was nearly 9.00pm by the time we got back down to the tents and our stomachs were in need of food. Due to the lumpy terrain we were pitched a distance apart so we said our good nights before snuggling down to fill up with hot food and drink. It turned out to be a pretty chilly evening for the time of year and I sat and watched the clouds lower over the summit. By the time that it got dark the tents were enveloped by hill fog. The previous night I probably had one of the worst nights I have had in a tent. It was windy when we pitched up our tents and when darkness fell the wind dropped as well. 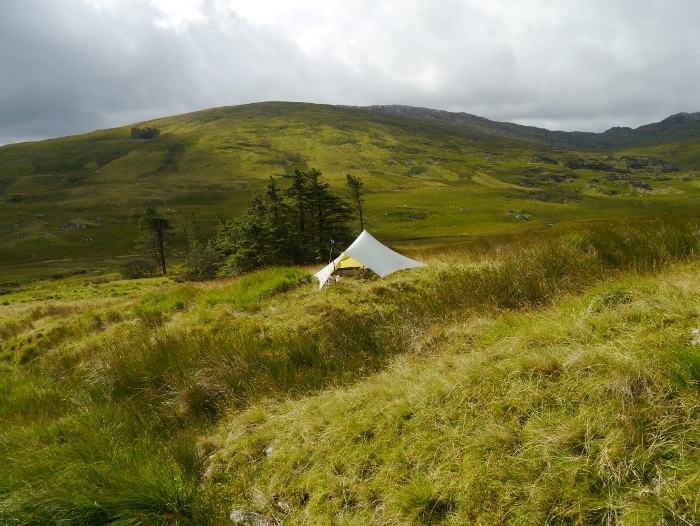 However during the night the wind increased and increased until the flapping of the tent made me a little nervous. I managed to doze and then woke to find myself strangely hot and clammy. Now as well as the wind the tent was being battered by hard pellets of rain. The temperature and humidity had risen sharply and things felt damp with condensation. My waterbottle looked like it had just been taken out of the fridge into a warm room. If I had been on my own I would have probably packed up at 4.00am and walked back to the van. I did not think Rae would have appreciated being woken at that time of day! My worry was of being engulfed by a thunderstorm on this exposed spot. A couple of experiences of storms in the hills have given me a bit of a phobia of them when exposed. Finally at 7.30am I just wanted to get up and move, the weather was getting even worse and something did not feel ‘right’. I braved the wind and rain and walked to Rae’s tent. I was surprised to find that less than 50 metres away her tent was only exposed to a gentle breeze. I woke her to find that she had had a really good nights sleep and the wind had been light all night! Somehow a small rise in the ground had deflected the wind over her tent. 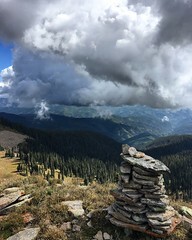 I explained that I was nervous about a storm approaching so we packed up without breakfast and by 8.00am were walking into the full force of the wind and rain. 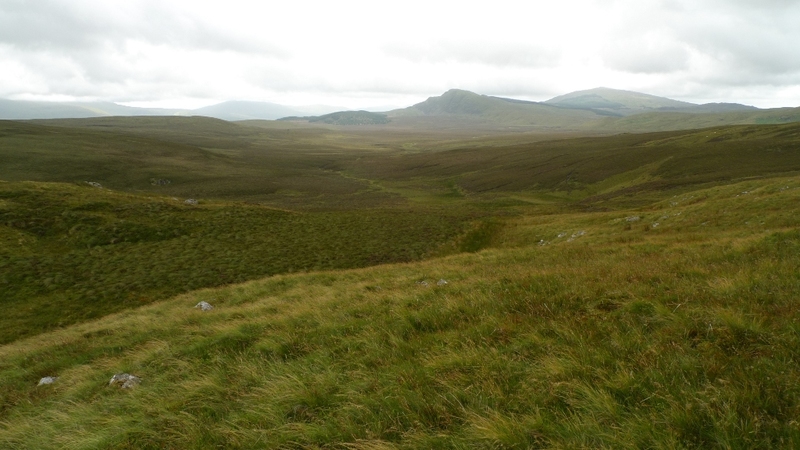 The far southern end of the ridge was a horrible boggy moras, quaking ground that with all the rain threatened to swallow up us whole. Navigation wise it would probably have been easier to take a southerly bearing and head directly off of the hill, but the force of the wind would have made it very difficult. We continued east before descending into a wide boggy bowl. We were relieved to see the outline of the forest loom out of the mist. We soon reached the track that leads east into Coed Gordderw and then forced ourselves off path deep into the dark gloomy shelter of the pines. Dripping we got the stoves on and had coffee and noodles, with wet hands it was a struggle to get lighter and stoves to light. We were wet, very wet and I realised that my trousers under my waterproofs were soaked, leading to very damp underpants! Leaving the damp stillness of the trees we continued along the increasingly disappearing and waterlogged track until we finally emerged into a field full of very frisky bullocks. They were young hooligans running along side us and we had to do a bit of shooing to get them to move away. It was with relief that we got safely on the other side of a fence! The track through Y Lordship was a narrow overgrown delight for the first kilometre or so, with the warm humid rain and low cloud all the vegetation made it feel almost tropical. However we were soon on the usual wide forestry track before the final road stomp back to the car. It was with relief that clean and dry clothes were put on.